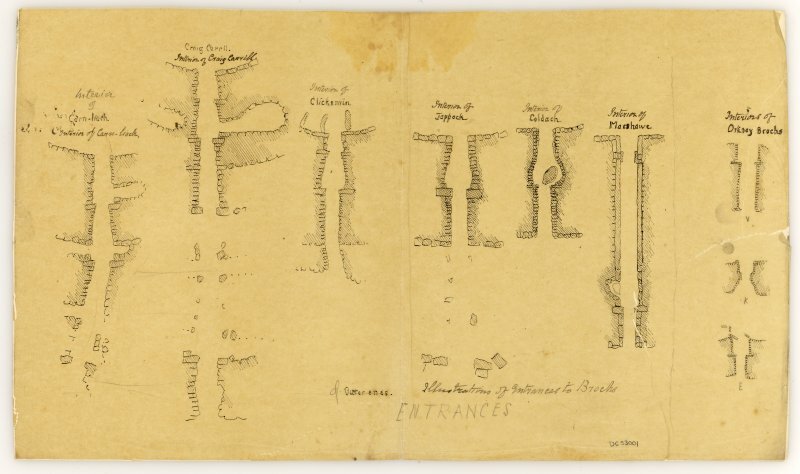 Plans of broch entrance passages. 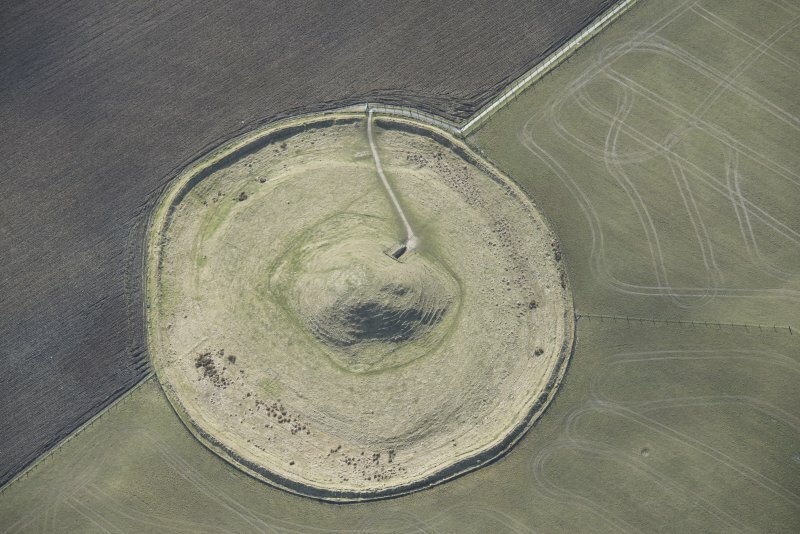 General oblique aerial view looking across Maes Howe with Hoy beyond, taken from the NE. 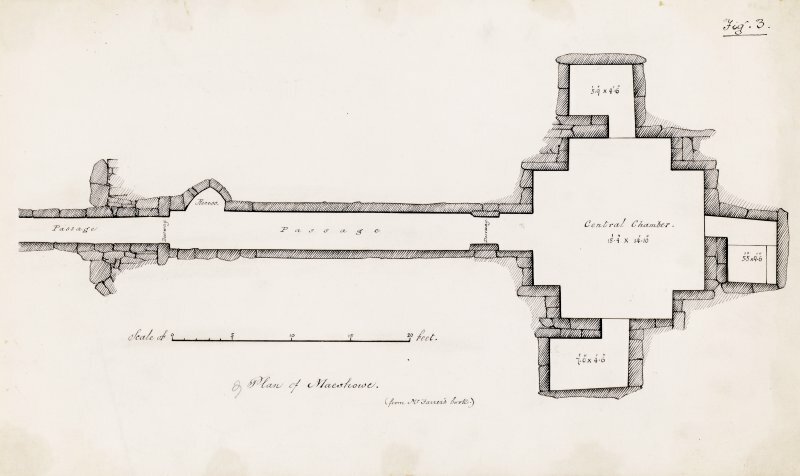 Scanned image of drawing showing an interior view of Maes Howe. Maes Howe, inner end of entrance passage. Detail of serpent knot carving. 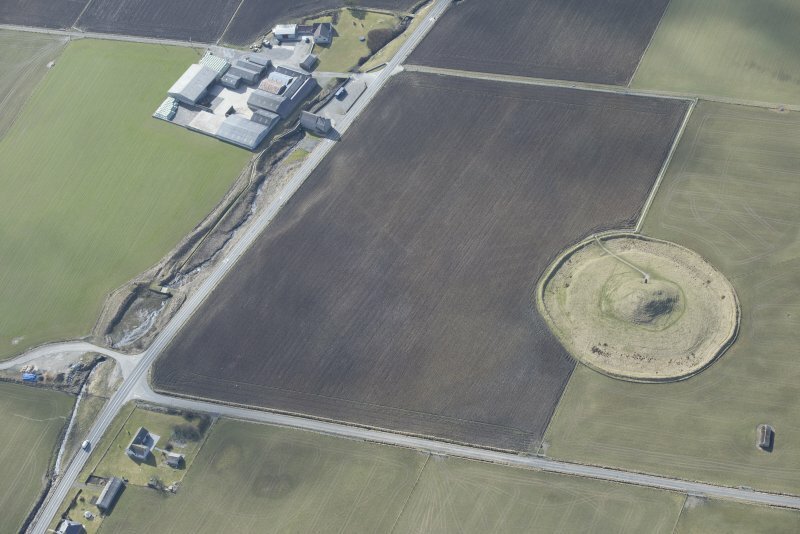 Oblique aerial view of Maeshowe Chambered Cairn, looking SW. 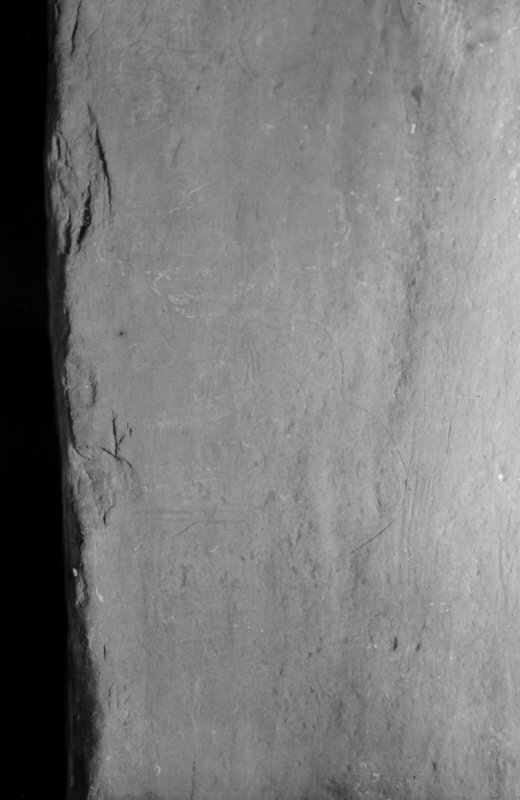 Interior of cairn; detail of runic inscription (No. 8). Maes Howe, general view from W.
Photographic copy of drawing showing an interior view of Maes Howe. 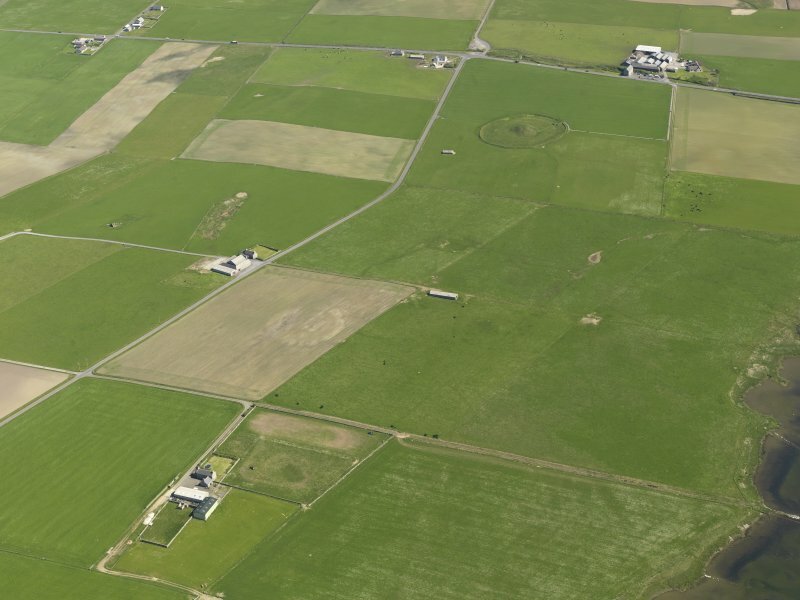 General oblique aerial view centred on the soilmarks of the enclosure at Overbigging with Maes Howe beyond, taken from the WNW. Interior of cairn; detail of runic inscription. 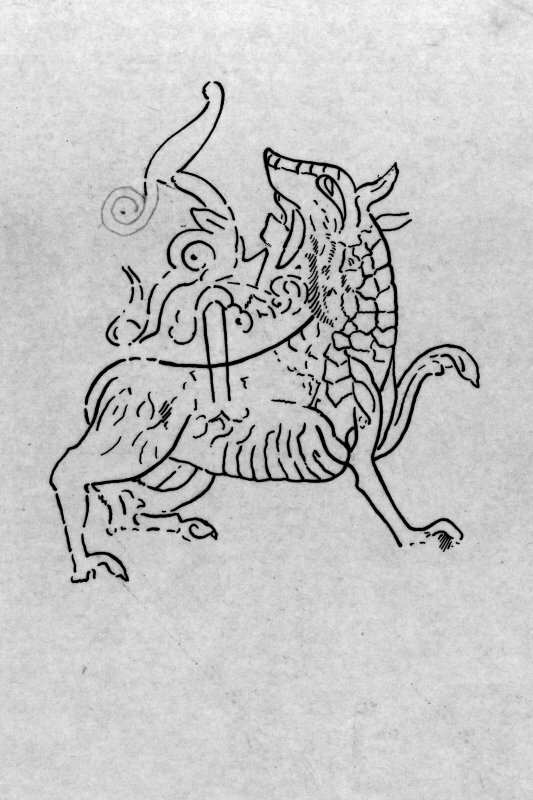 Tracing of dragon engraving, probably from photograph. Mounted on card and filed in photograph boxes. 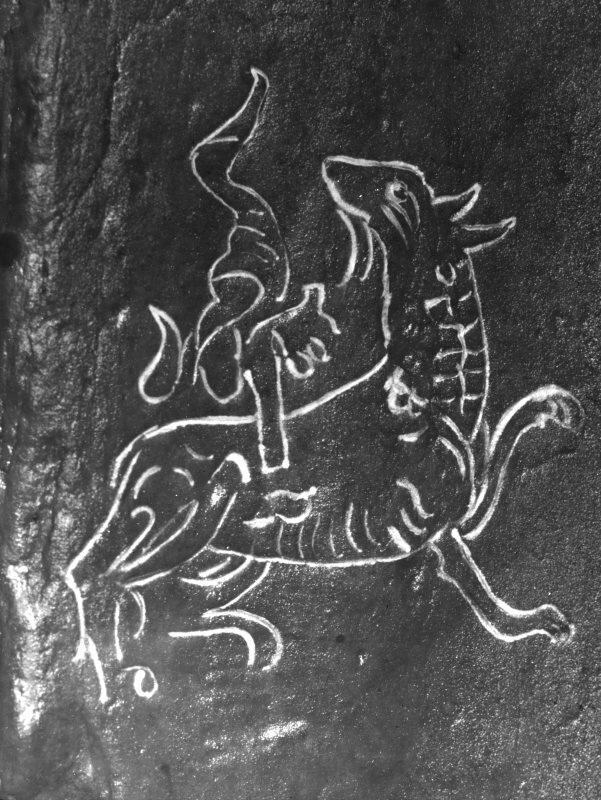 Detail of Norse dragon carving. 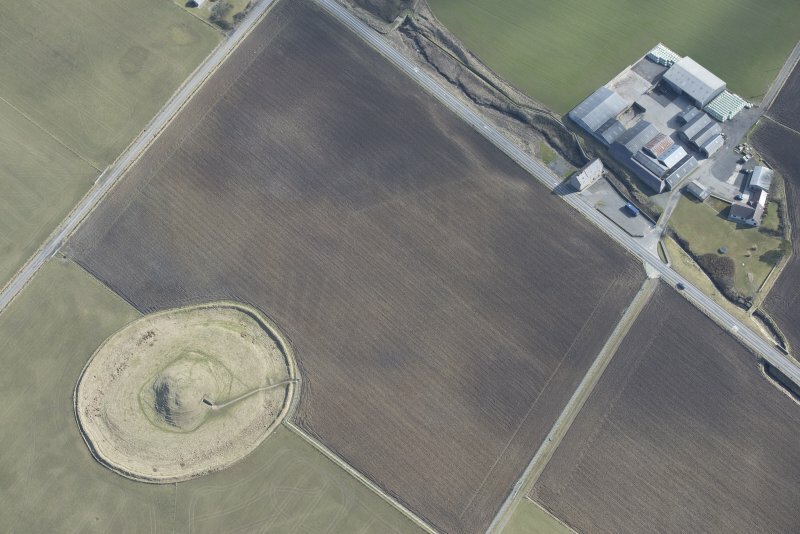 Oblique aerial view of Maeshowe Chambered Cairn, looking SSE. 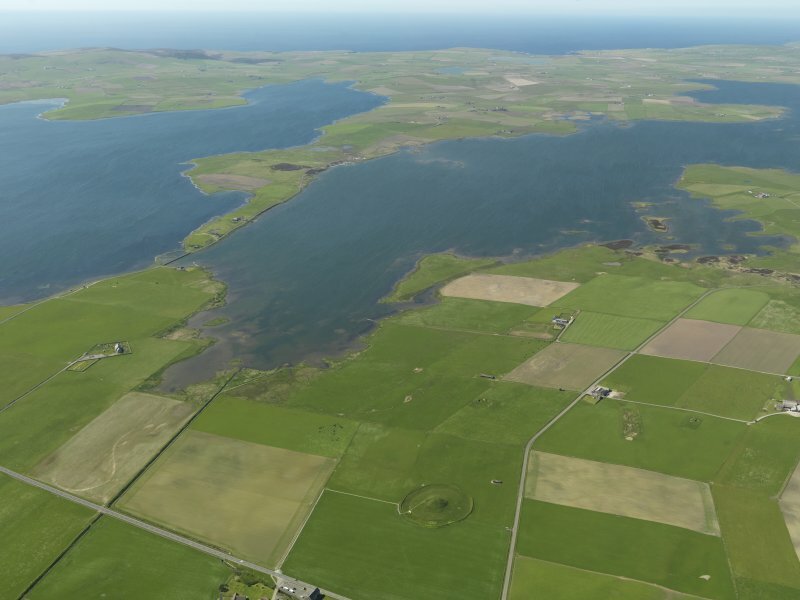 General oblique aerial view of the Loch of Stenness with Maes Howe in the foreground and Hoy in the distance, taken from the NE. 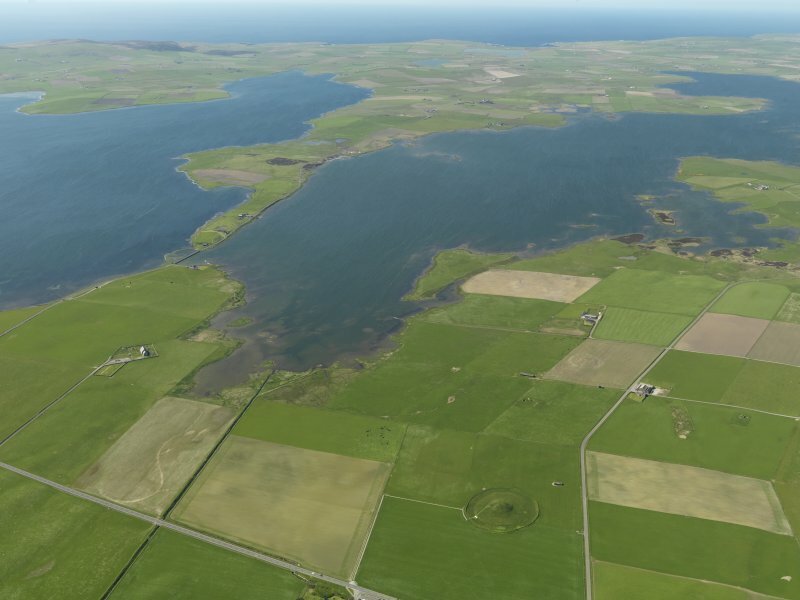 Oblique aerial view with Maes Howe in the foreground looking towards the Loch of Harray with the Ring of Brodgar beyond, taken from the NE. 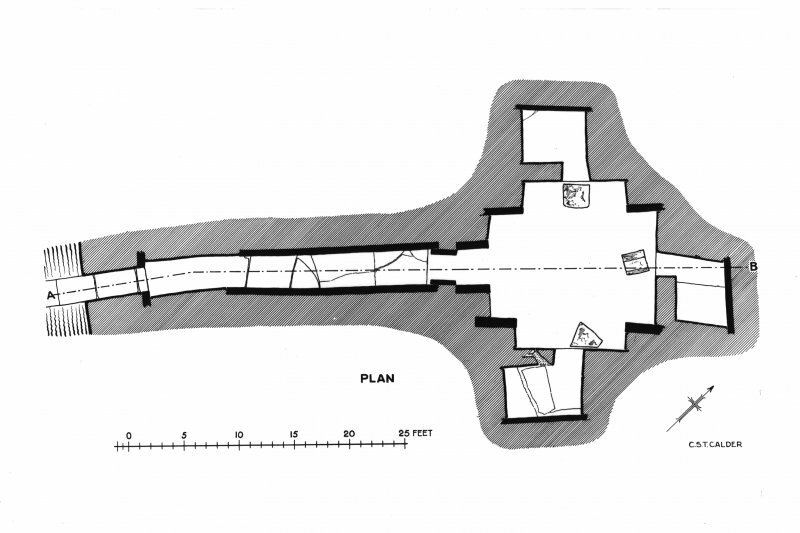 Sketch showing plan of Maes Howe chambered cairn. Plan and section looking NW of Maes Howe chambered cairn and earthworks, with measurements. 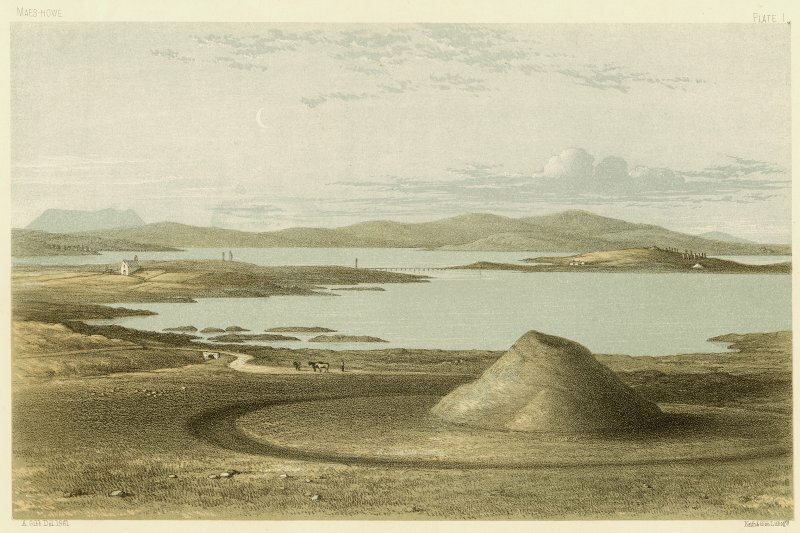 Drawn by H Dryden in 1866 from G Petrie 1861. Section through N cell, chamber and passage of Maes Howe looking SE; sections through chamber and side cells looking SW and NE; section through N passage, chamber and N cell looking NW; ground plan of chamber and passage, all with annotations and measurements. 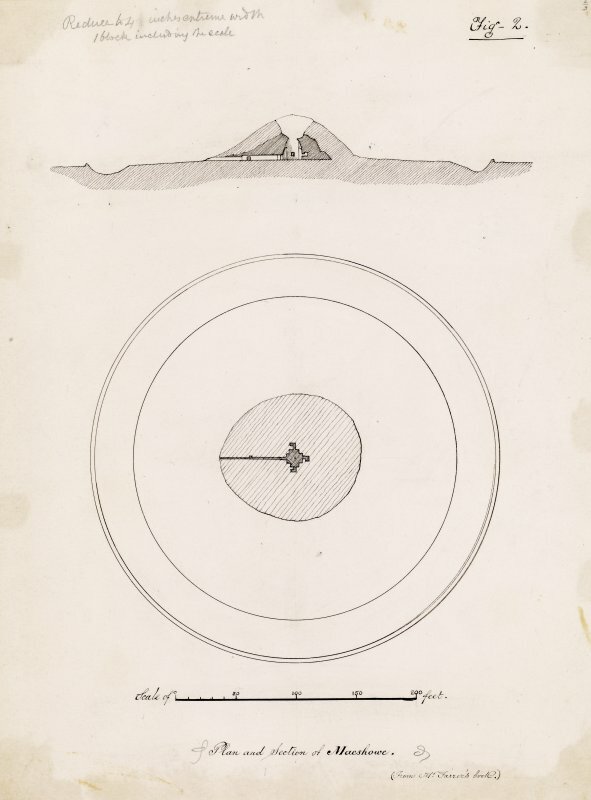 Drawn by H Dryden in 1866, using own bearings and some measurements, together with measurements taken by G Petrie in 1861. 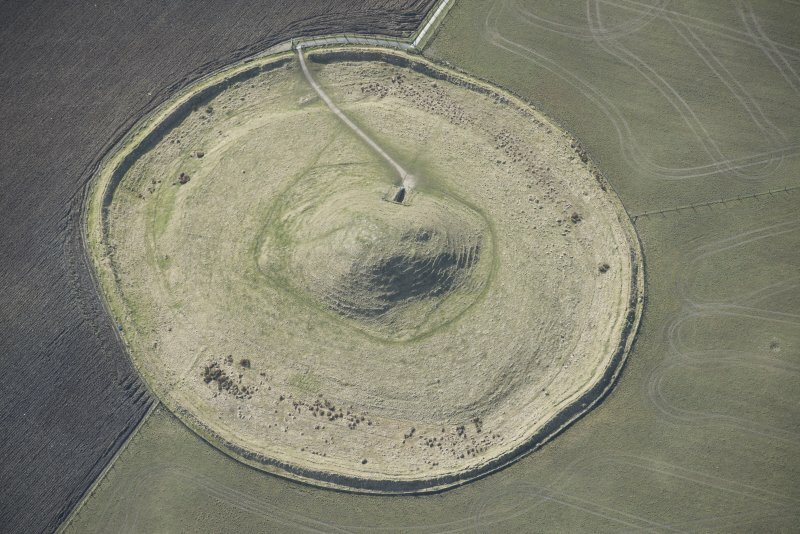 Oblique aerial view of Maeshowe Chambered Cairn, looking NNE. 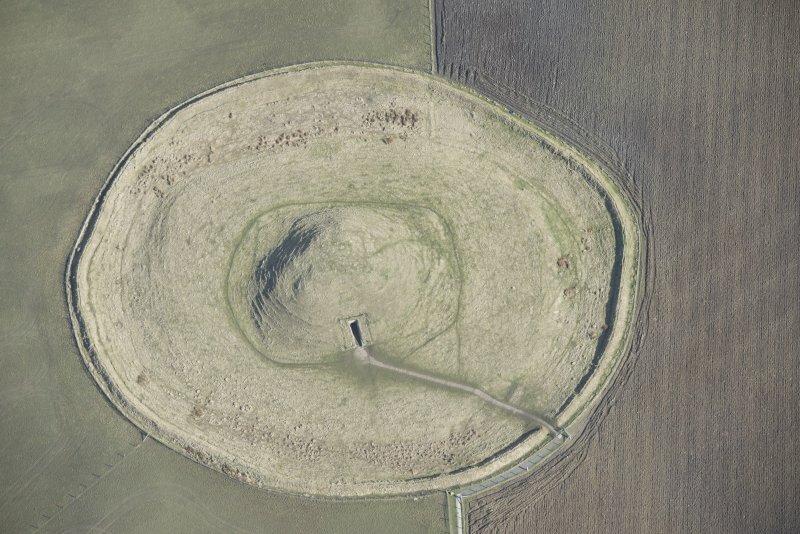 Oblique aerial view of Maeshowe Chambered Cairn, looking NE. 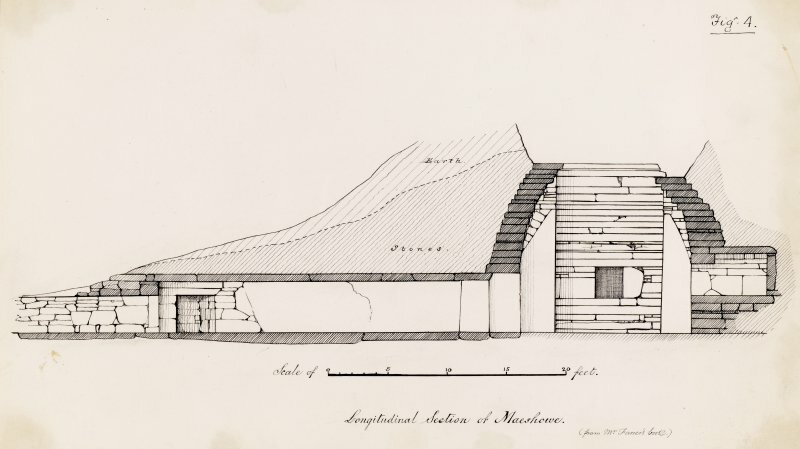 Drawing showing general view of Maes Howe. 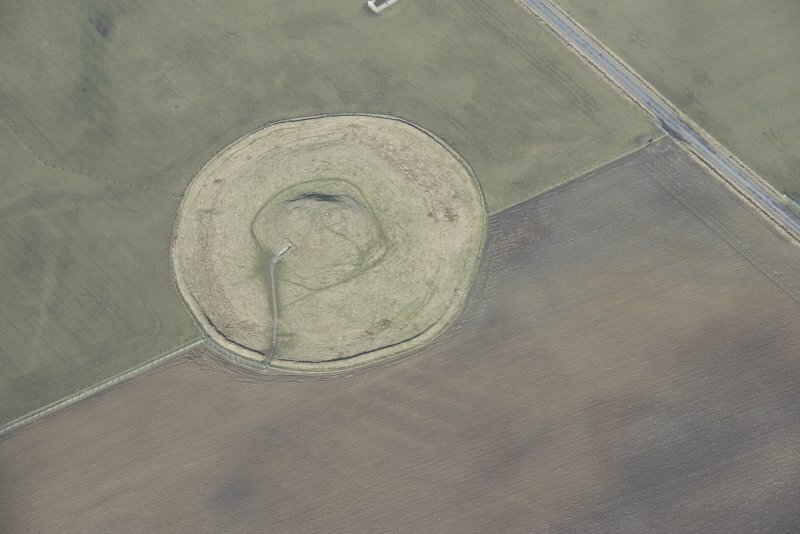 Oblique aerial view of Maes Howe. View of cairn from south west. 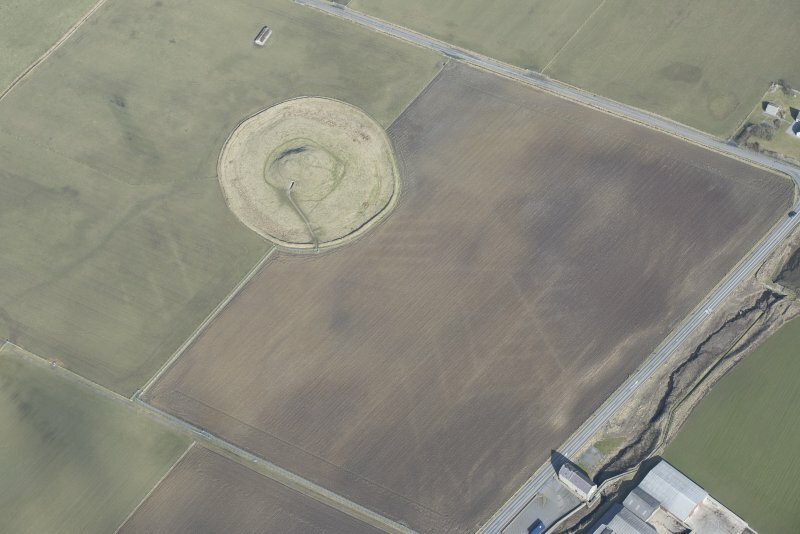 Oblique aerial view of Maeshowe Chambered Cairn, looking S.
Oblique aerial view of Maeshowe Chambered Cairn, looking SSW. 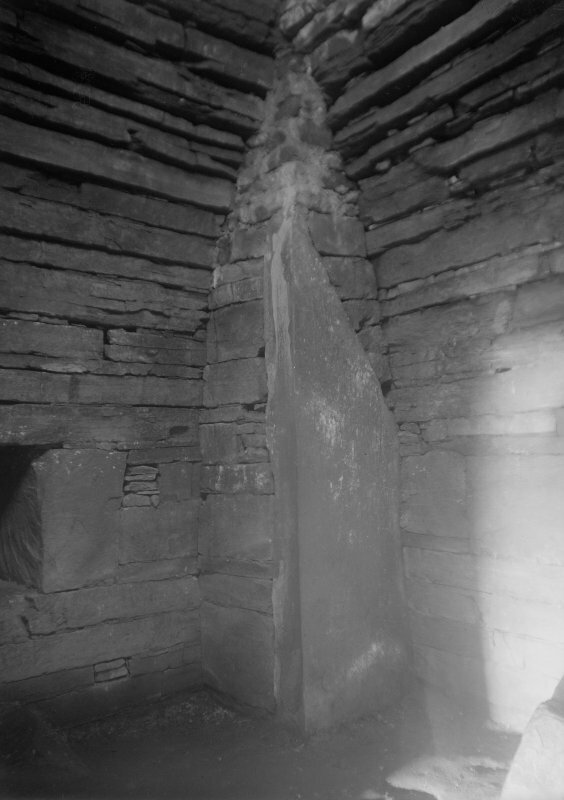 Interior of cairn; north west angle. 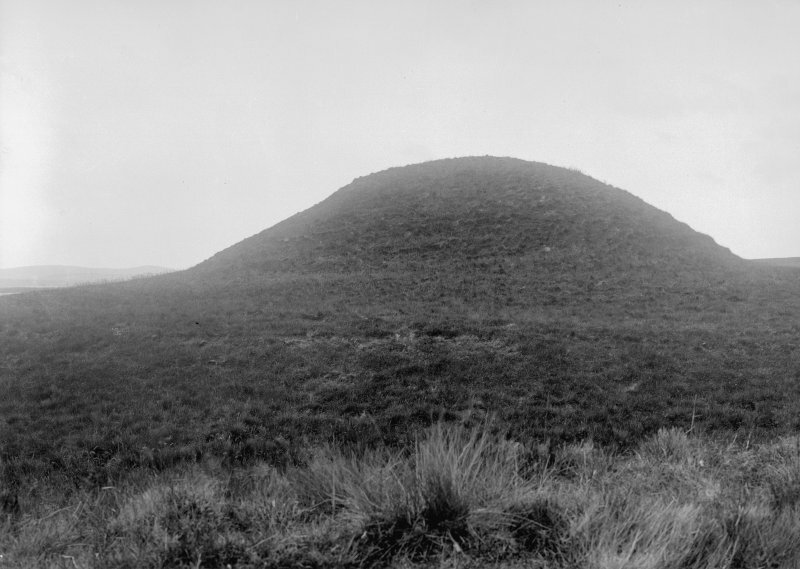 General view of cairn from north west. 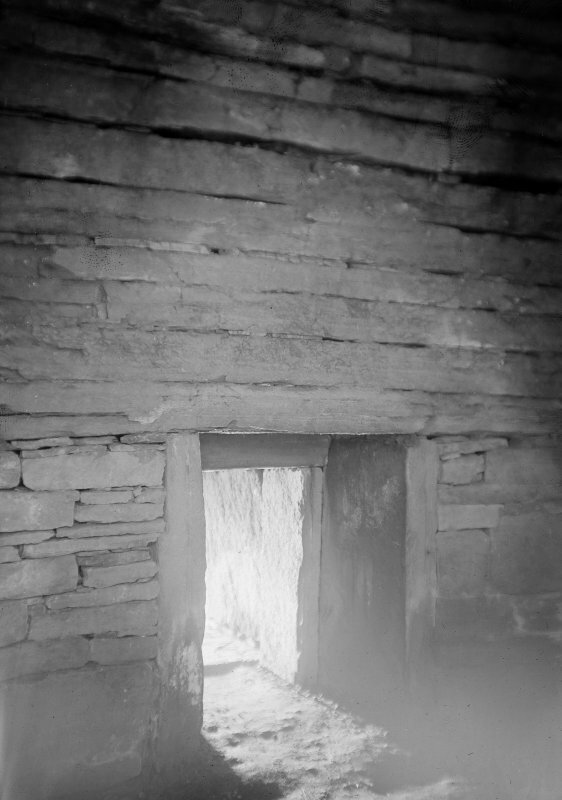 Maes Howe, interior of chamber. 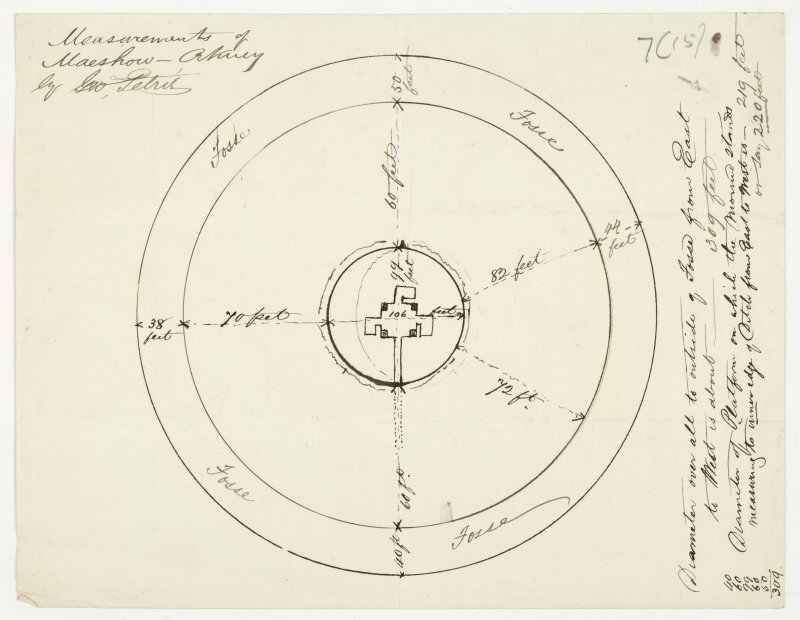 Publication drawing; plan of Maes Howe chambered cairn. Photographic copy. General view of cairn from south. General view of cairn from south west. 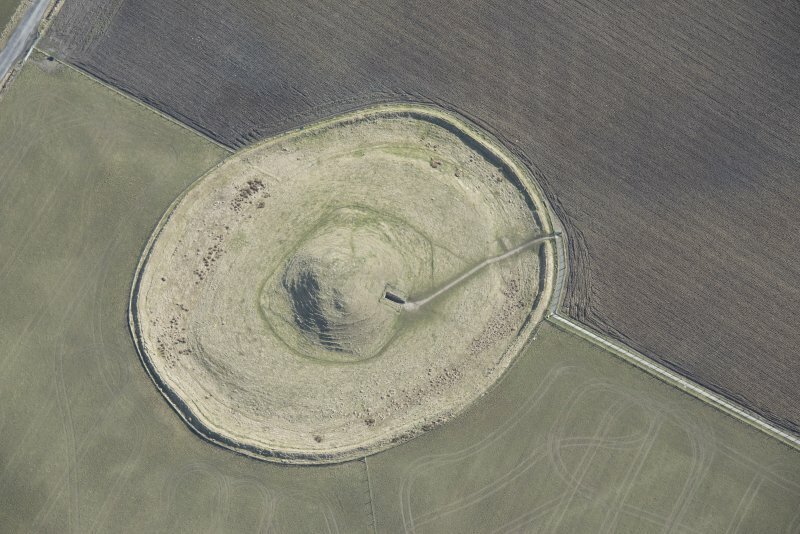 Oblique aerial view centred on Maes Howe, taken from the ESE. 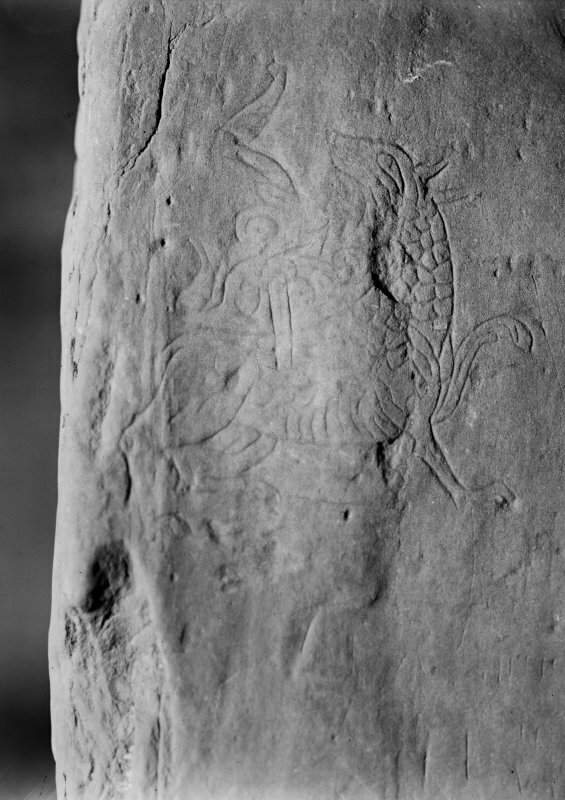 Detail of Norse Dragon (The Lion) carving in Maes Howe. OS 6" map, Orkney, 2nd ed., (1903). Maes Howe chambered cairn is the finest megalithic tomb in the British Isles and dates from Neolithic times, c. 2000 BC. On various stones of the great central chamber are twenty-four runic inscriptions and three engraved figures, those of which can be dated being 12th century. Ministry of Public Buildings and Works (MoW) 1950; RCAHMS 1946; A S Henshall 1963; J Stuart 1865; V G Childe 1956; B Dickens 1930; G Petrie 1866. 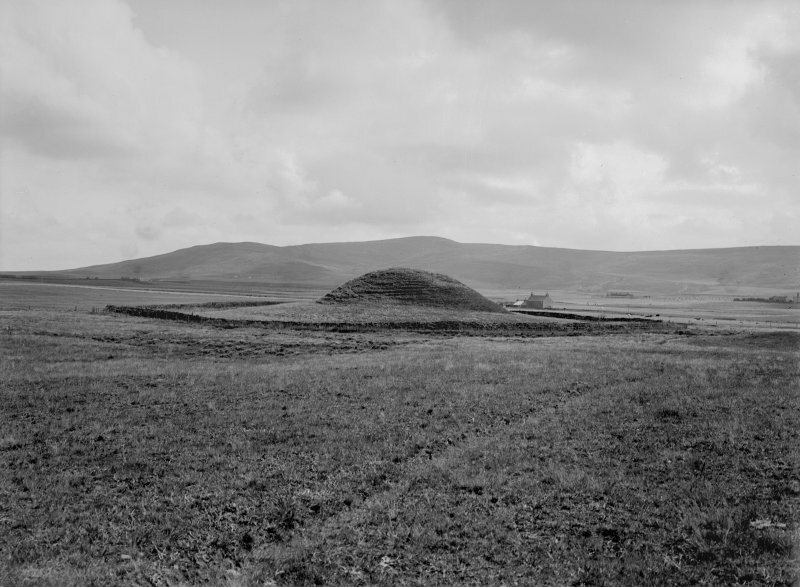 Maeshowe (MoW nameplate) is as referred to by the above references. Two periods of excavation were undertaken in response to the laying of a new pathway, rabbit damage, and the installation of a new drainage system. 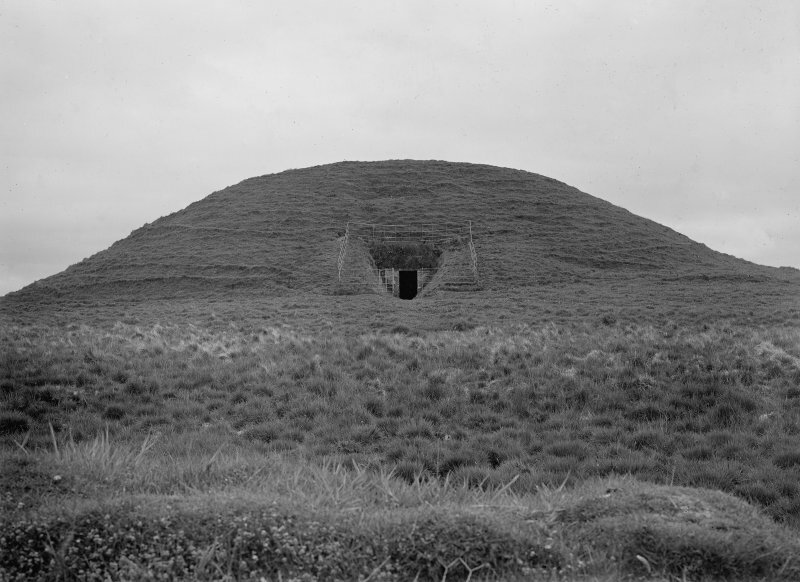 The first investigations focused on an examination of the platform upon which Maeshowe is built. The platform was found to be a combination of a modelled natural sandstone mound and a laid silty clay. Directly outside the present entrance to the tomb, below the clay platform, the remains of a stone paved pathway covering a stone drain was discovered. 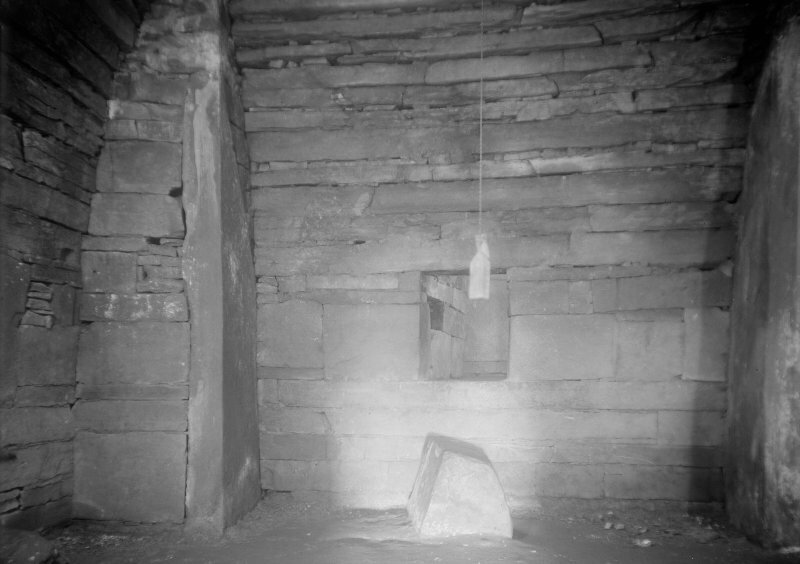 This is undoubtedly part of an entranceway into an earlier structure lying below Maeshowe tomb. The second excavation examined the outer bank and an area of the platform at the rear of the tomb. The encircling bank was found to have started life as a substantial wall, approximately 2m thick, and probably of similar height. After a relatively short period of time this collapsed creating a pile of rubble running into the ditch. This wall can be provisionally dated to the late Neolithic - Early Bronze Age since the ditch silts and peat which developed in the Bronze Age lay on top of the collapse. At a later date (probably the early historic period) a further deposit of stone rubble was placed on the collapsed wall effectively creating the bank appearance which we see today. A small trench on the platform at the rear of the tomb located a large stone socket with its packing intact. The standing stone had been removed in antiquity. 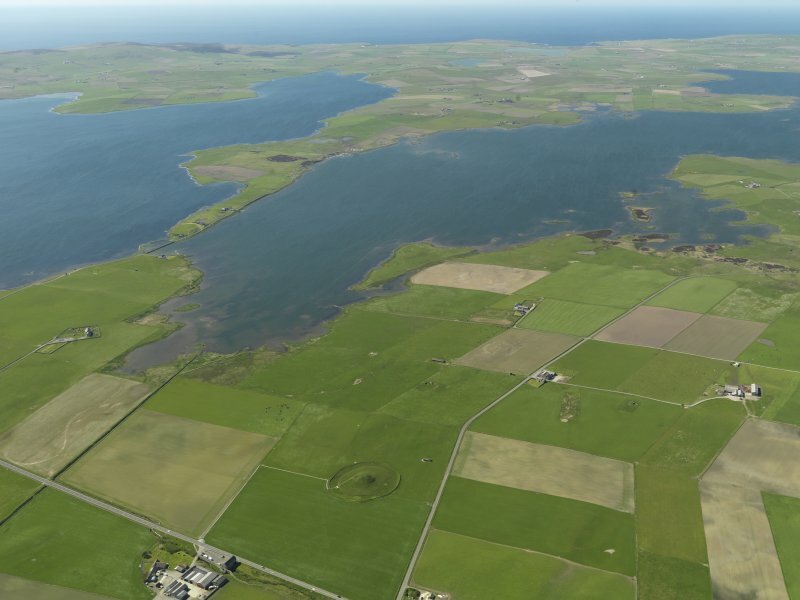 The size of the upright would have been comparable to the stones composing the Stones of Stenness and from the position of the Maeshowe stone it is quite possible that it was also part of a stone circle which would have surrounded the tomb. 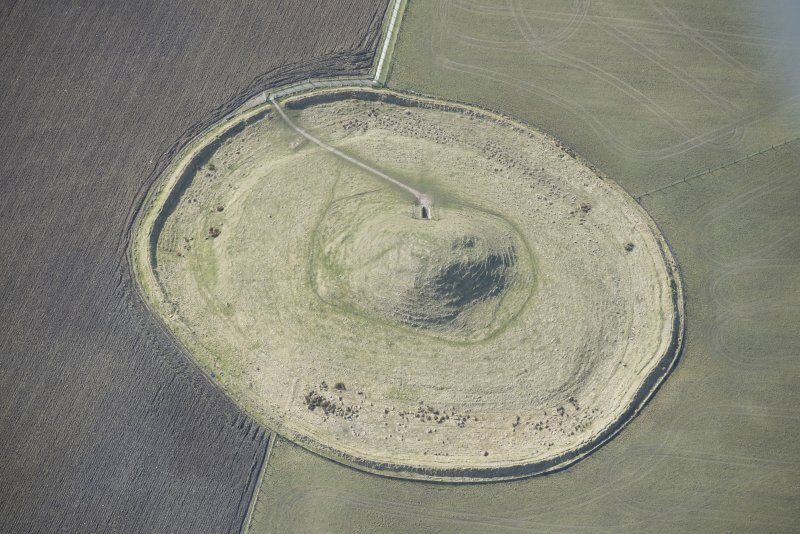 An early third millennium BC chambered cairn. 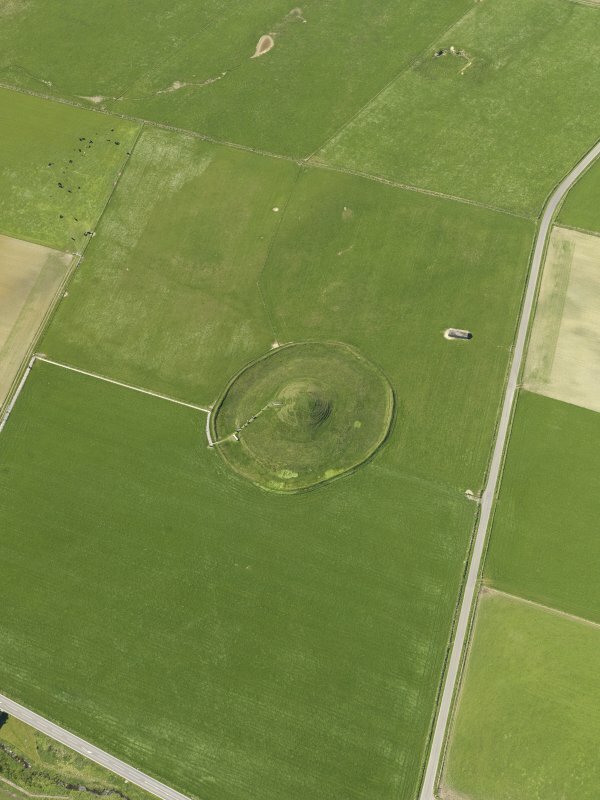 Built on a levelled circular platform, encircled by a low bank composed of earth scraped up from a shallow ditch on its inner side; the mound itself, 25m in diameter and 7m high, consists largely of clay and stones with an inner core of stones casing and supporting the chamber. The outermost part of the entrance-passage has been restored, but from the door-checks inwards it is original. The passage is quite spacious, although at a height of 1.4m it is not possible to walk upright. The main chamber is about 4.5m square and was originally about the same height, with three side-cells entered above ground-level; in each corner there is a buttress designed to help support the weight of the corbelled roof. 12th century runic inscriptions have been incised in the main chamber. This is one of the largest extant collections of runic inscriptions carved in stone. There are about thirty inscriptions, including both ordinary runes and cryptographic twig runes, and there are also some beautifully executed carvings of a walrus, a serpent knot and a dragon or lion on the north-east buttress, all in typically vigorous Scandinavian style. 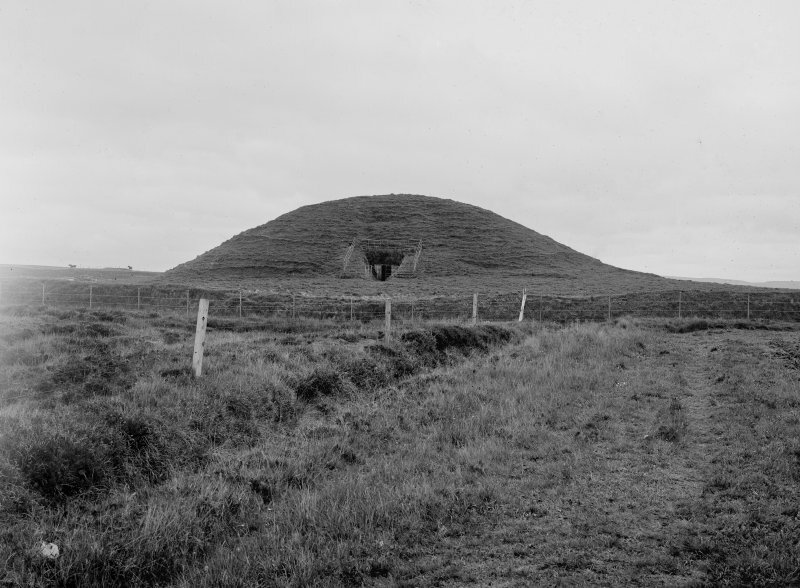 After excavations in the 1970s, when structural evidence for a rebuilding of the bank encircling the mound was radiocarbon dated to the 9th century AD. It now seems possible that the tomb was re-used and its external appearance improved for the burial of a Viking chieftain, whose rich grave-goods were stolen three centuries later. 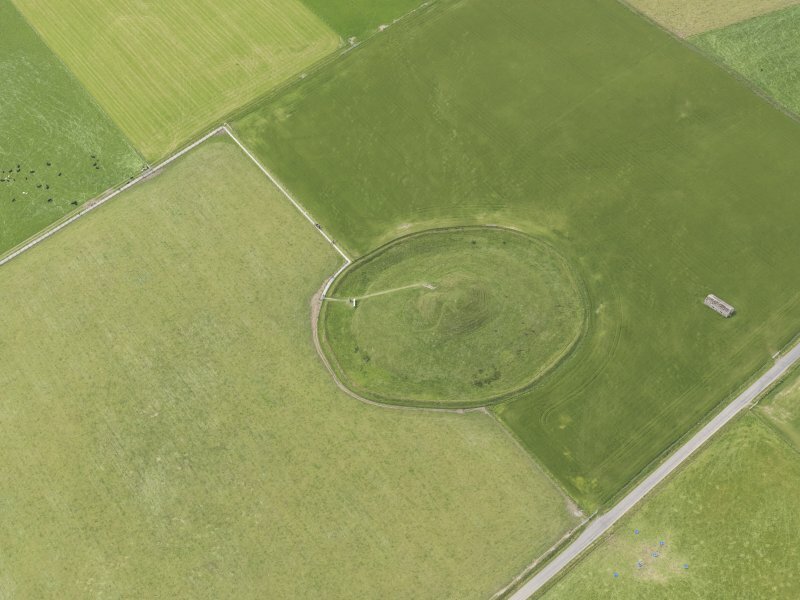 'Hakon alone bore the treasure out of this mound' records one of the inscriptions, while another insists 'It is certain and true as I say, that the treasure has been moved from here. The treasure was taken away three nights before they broke into his mound'. HY 318 127 Archaeological monitoring was required at Maes Howe (NMRS HY31SW 1) in April 2000 while a programme of rewiring was undertaken. 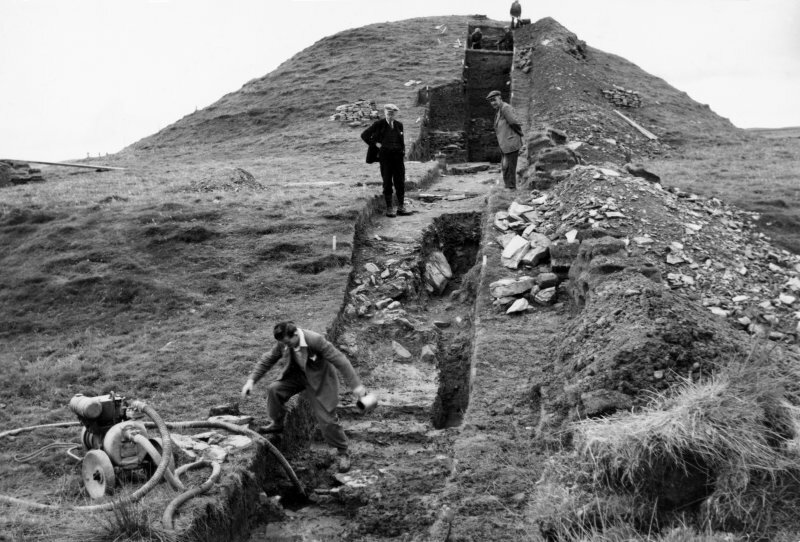 The work involved shallow excavations both within the main chamber of the monument and on the overlying mound. 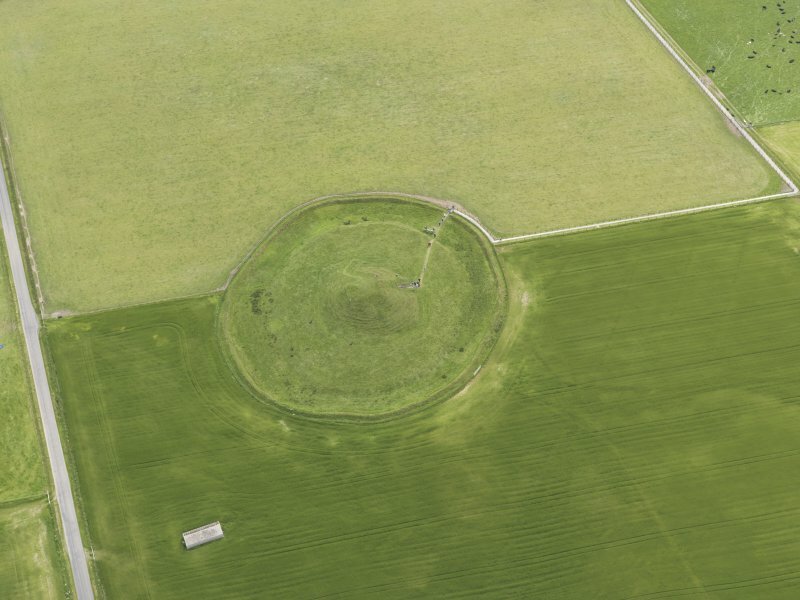 The presence of a slab of concrete over the top of the mound indicated the high level of disturbance. No finds were recovered. 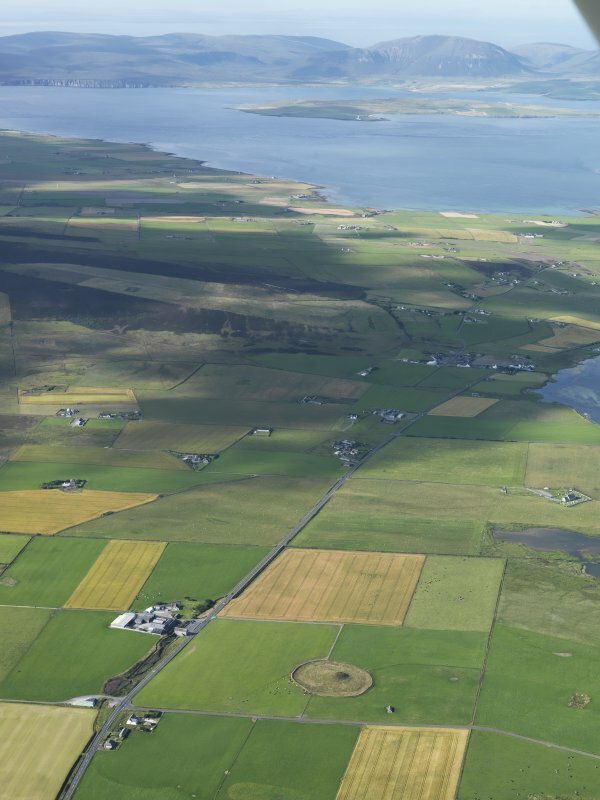 Holes measuring 800 x 700mm and 180-230mm deep were dug for plaques at three sites in the parish of Stenness, Mainland Orkney. 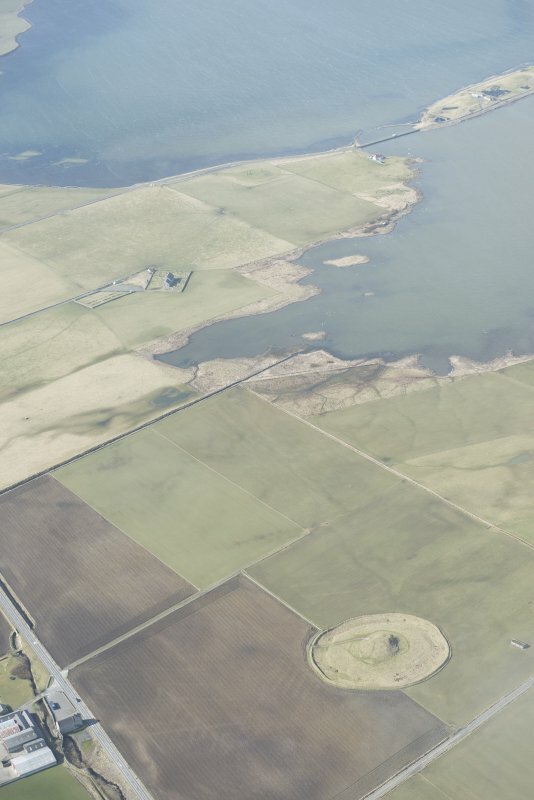 One hole was located near the Ring of Brogar (HY 2946 1346; HY21SE 1), one at the Stones of Stenness (HY 3071 1239; HY21SW 2) and one at Maes Howe (HY 3180 1272). Nothing of archaeological significance was discovered in any of the holes. 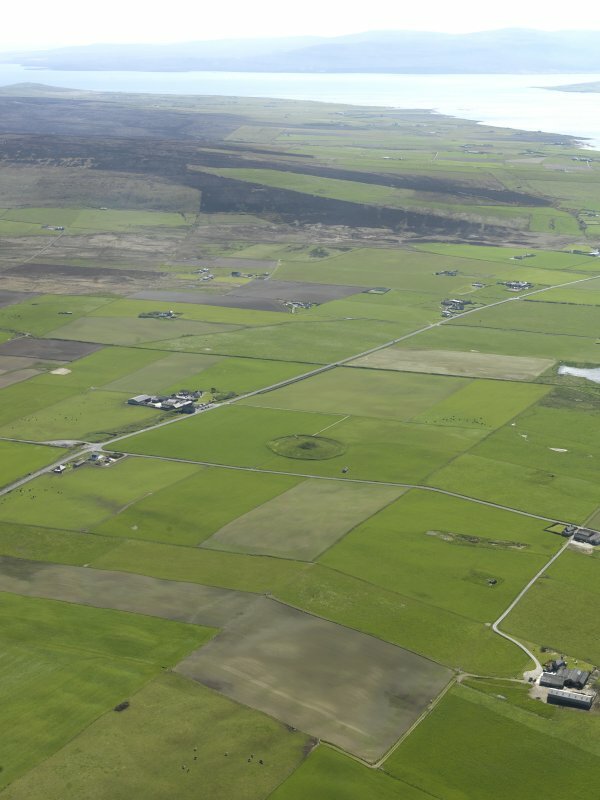 HY 30 13 (area) A third season of geophysical survey was undertaken between March and October 2004 in and around the 'Heart of Neolithic Orkney' World Heritage Site (DES 2003, 102). Over 35ha were surveyed using magnetometry. Results have further clarified the extent of known sites and discovered many new ones. 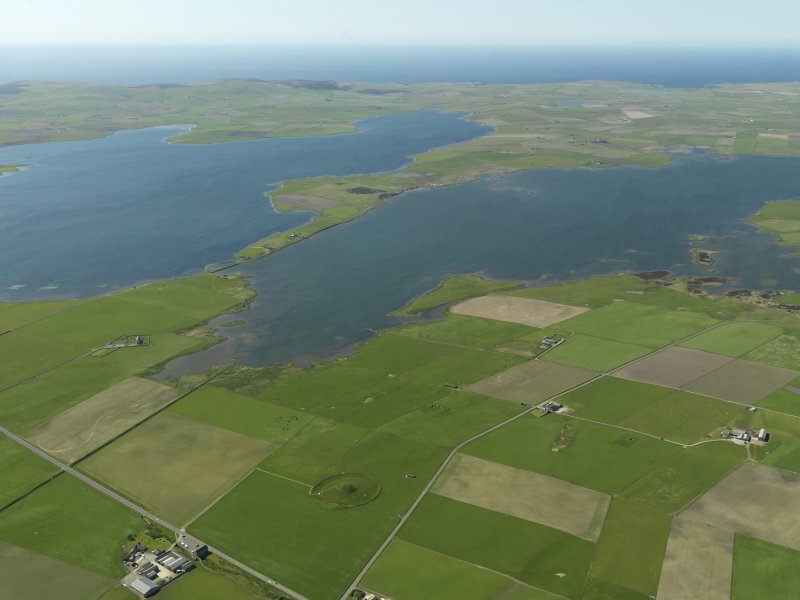 Further survey between the Ness of Brodgar and the Ring of Brodgar (centre HY 299 131) revealed boundary features, possible unknown burnt mounds and barrows, and areas of general background increased magnetic response. 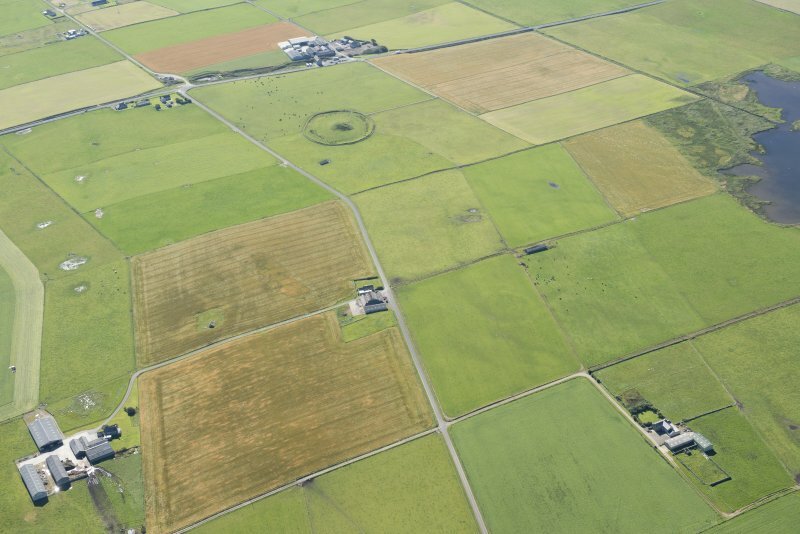 This response is similar to that surrounding the Neolithic complex on the Ness of Brodgar, which test pitting has shown is the result of Neolithic midden-enhanced soils. The area to the NW of Maes Howe (centre HY 314 129) was dominated by geological anomalies and modern disturbance. However, isolated features may represent a possible new settlement site and other archaeological features. A variety of responses have been detected to the SW of Maes Howe (centre HY 314 126). The northern half of the area is dominated by zones of magnetic disturbance generated by igneous dikes, and throughout the area short linear ferrous-type responses have been noted which are consistent with a series of land drains. Potentially archaeologically significant anomalies have been noted in the SW, including weak suggestions of an oval enclosure and general areas of increased magnetic response. In addition, a group of well-defined anomalies suggesting possible enclosures has been located further S.
Reports lodged with Orkney SMR and the NMRS. Sponsors: HS, Orkney Islands Council, GSB (Bradford), Orkney Archaeological Trust, Orkney College. 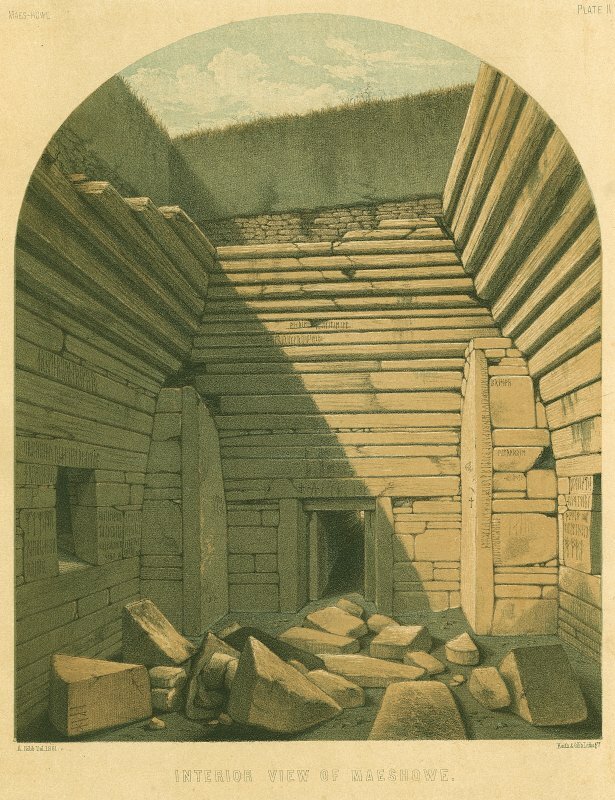 'The Orkney Herald' describes the excavation of Maes Howe in 1861. 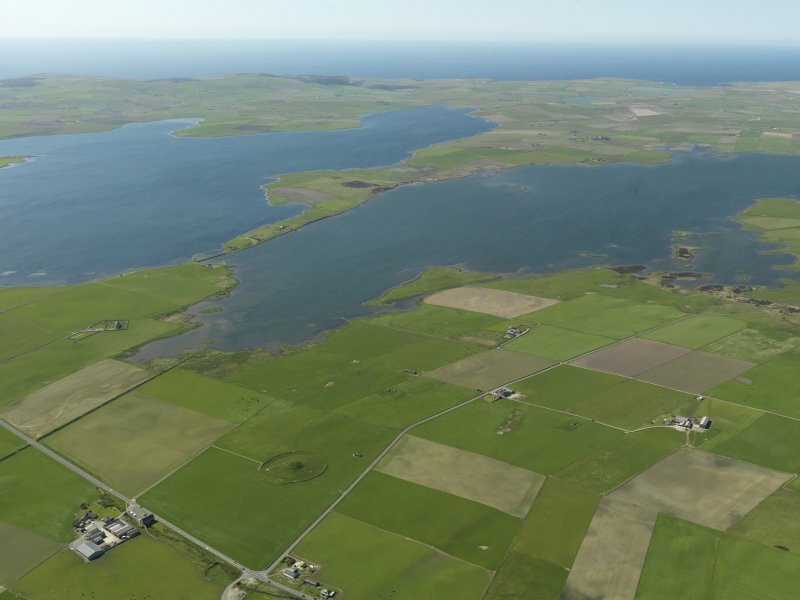 This site is described by 'The Orkney Herald' in 1906 and 1908. 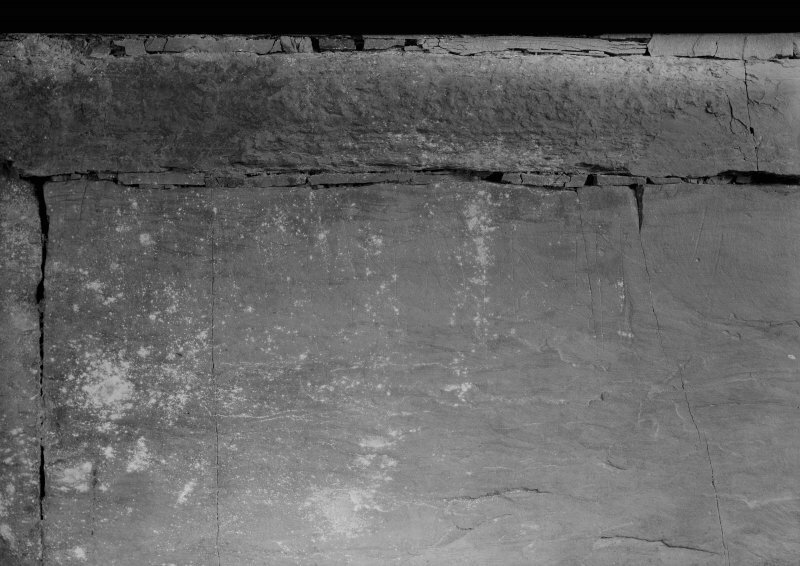 Watching brief HY 3182 1277 Persistent problems with water ingress into the roof of the tomb (HY31SW 1) has been reported since the 19th century. Archaeological monitoring and evaluation were undertaken as part of a programme of works to investigate the cause of the problem and undertake remedial works. The cairn was re-opened in the 19th century, and a new stone roof added, resting on the original Neolithic masonry. The initial phase of works in July 2005 comprised the excavation of three 1m2 trenches to locate and examine the concrete 'raft' believed to have been installed over the roof in the early 20th century. 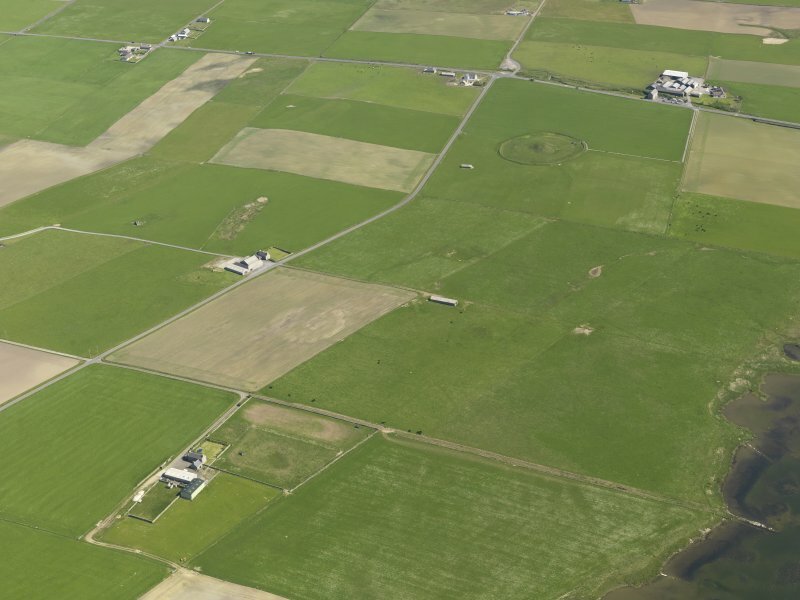 HY 3 1 (vicinity) A fourth season of geophysical survey was undertaken between January and November 2005 in and around the Heart of Neolithic Orkney World Heritage Site (DES 2004, 97). This included more than 40ha of gradiometer survey, together with targeted resistance and ground penetrating radar (GPR). Survey to the SE of Maes Howe (centre HY 319 127) defined an area of increased magnetic response. However, interpretation of this anomaly is confused by apparent damage caused by subsequent ploughing. Reports lodged with Orkney SMR and NMRS. Sponsors: HS A, Orkney Islands Council, Orkney Archaeological Trust, Orkney College Geophysics Unit. HY 3182 1277 Further to exploratory work earlier in 2005 (DES 2005, 100, ) a second phase of works was carried out in October 2005. This involved the excavation of a trench c 10 x 10m to fully reveal the concrete raft covering the roof of the tomb. The aim of the exercise was to allow the relaying of its bitumen upper surface, as well as the laying of a waterproof membrane around its edges and the reinstatement of the drain around the edge of the raft. 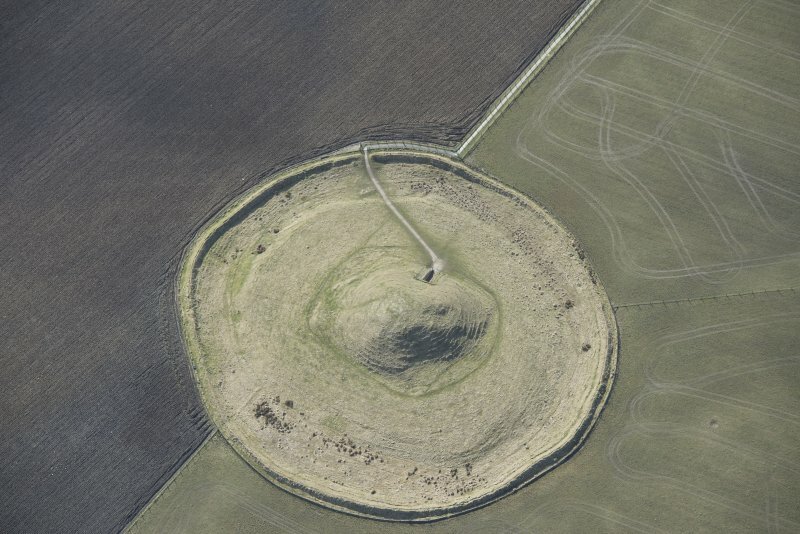 This drain was assumed to run off the summit of the mound in its SE corner (its lowest point), and run into the ditch. In the event the drain only just ran off the edge of the concrete raft before petering out, and a third phase of work was undertaken in December 2005 to find a suitable course for this. Excavation began with the removal of turf from the summit, over an area determined by the limits of the raft as identified in the earlier test trenches. This comprised an initial area roughly 10m square, although as the work progressed this was slightly extended. 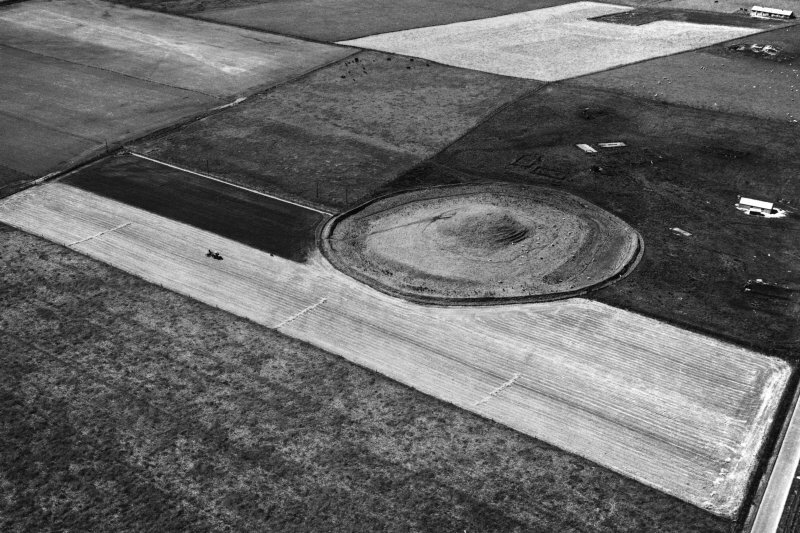 The excavations on the summit demonstrated that the early 20th-century roof comprises a square raft of concrete, domed towards the centre, some 9m across, with a bitumen coating. A drain was formed around the edge of this by infilling the 'lip' at the limits of the raft with sand and gravel, and laying slates over this. The concrete raft was then covered by a substantial deposit of silty clay, which was remarkably homogeneous and free of finds. This was generally 650mm thick, but thinned to 350mm at the edge of the trench, continuing beyond the edges of excavation. This upper area of early modern landscaping appeared, prior to the excavation, as a more rounded, gentle shape than might have been expected from the steepness of the sides of the mound. The material against which the concrete was cut was variable in colour, but consistently very compact silty clay, rich in stones. Very little of this material was excavated, and no finds recovered, so its date is unknown, but it was thought that it was very unlikely to represent undisturbed Neolithic mound material. It is more likely that it represents the remains of earlier disturbance against which the roof was cut. 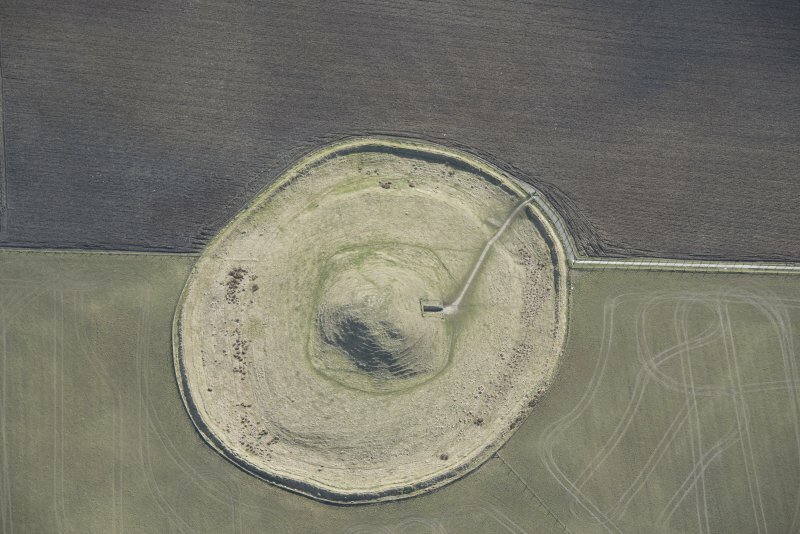 The absence of any drain to take water collected by the concrete roof made it necessary to install a pipe running from the SE corner of the newly bitumen-covered concrete roof down the S slope of the mound towards a stone-lined drain in the base of the ditch, c 25m to the S of the base of the mound. 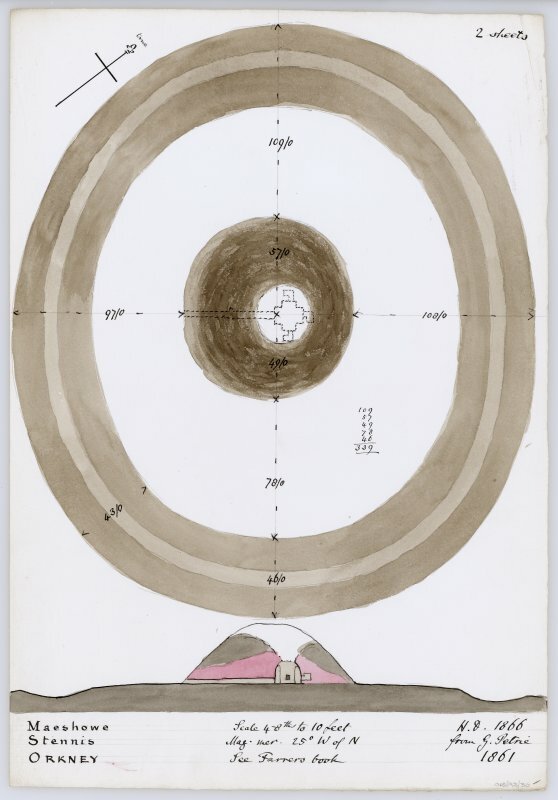 Initially, after the line of the trench excavated by Childe in the 1950s (PSAS 1956) was found towards the top of the mound, it was possible to follow the E edge of his trench down the slope to create a channel through previously disturbed ground. Unfortunately this was not possible further down the slope, as it seemed that Childe's excavations had not penetrated to a sufficient depth to leave a clear edge. A shallow trench was opened over a larger area in an attempt to re-establish the line of Childe's trench. The complicated sequence found in the sondage in the E side of this trench included compact deposits, unlikely to be recent backfill, indicating that significant archaeological material survived in this area. The works indicated the survival of stratified deposits, but given how little had been seen in the side of Childe's trench further up the slope, these were of uncertain date and significance. The clay-flecked deposits found along the S side of the trench at the base of the excavation lay as little as 100mm below the turf and seem likely to represent undisturbed Neolithic layers. As these seem to lie within the course of Childe's trench, it must be assumed that he did not fully excavate all the deposits he encountered. For these reasons, it was decided to use a narrower diameter plastic pipe, buried in the top 20mm of topsoil, although this would require more frequent maintenance. From the base of the slope of the mound across the level platform and into the ditch to the S, only a very shallow trench of maximum depth 80mm was dug to accommodate this narrower pipe. Across the platform the upper surface of presumed Neolithic layers was found only 70-80mm below the modern turf. Excavation in the ditch at the far S end of the trench revealed a stone-lined and capped drain to sit in a tight cut, and to be in apparent working order. 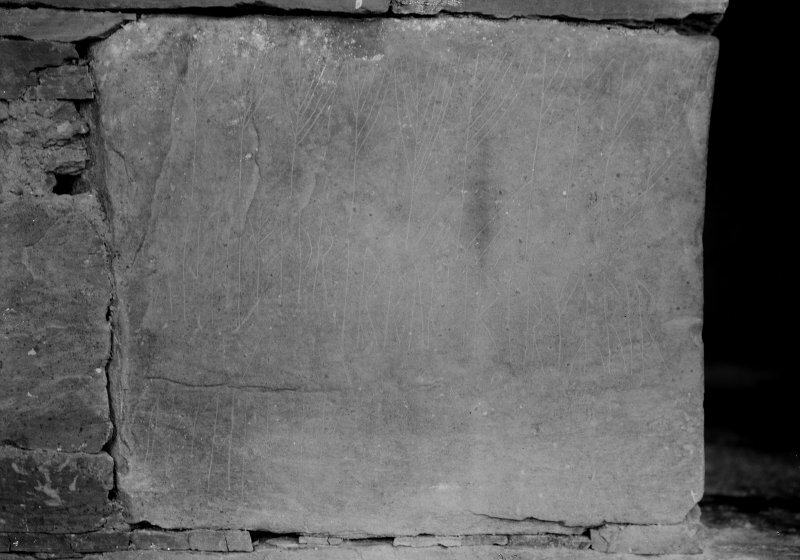 Although not capped by Orkney roof slates, this style of construction, with a smaller slab over the join between two larger slabs, is identical to that used in the drain on top of the concrete raft, perhaps indicating that these are contemporary. Almost all deposits encountered during this project were silty clays, merely varying in colour, compaction and inclusions. Much of this material (from both recent and ancient work) is probably locally derived, meaning that the definition of archaeological layers on this site is technically very challenging. 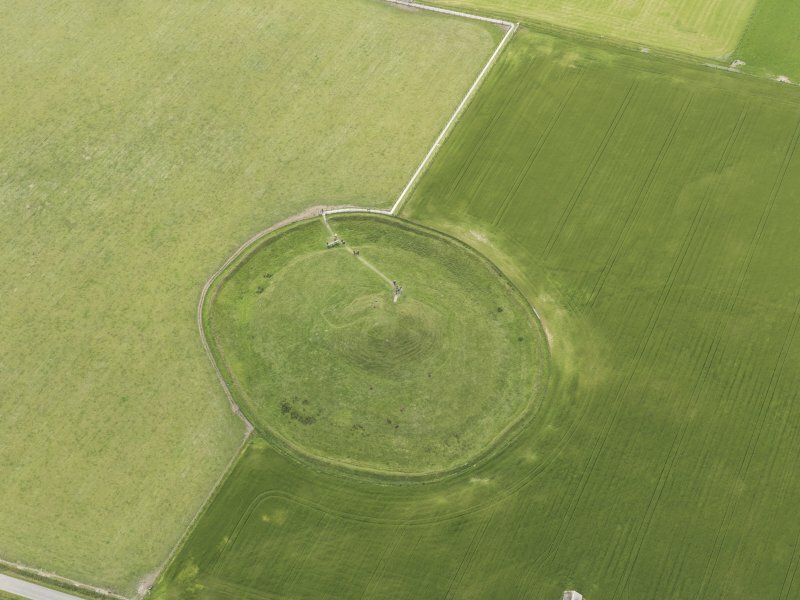 It is recommended that any future ground disturbance work is done under strict archaeological controls, and in an area of sufficient size to allow a reasonable understanding of what is found. Archive deposited with Orkney SMR held at Orkney College, Kirkwall, Orkney Archive to be deposited in NMRS. David Murray and Andrew Hollinrake, 2006. 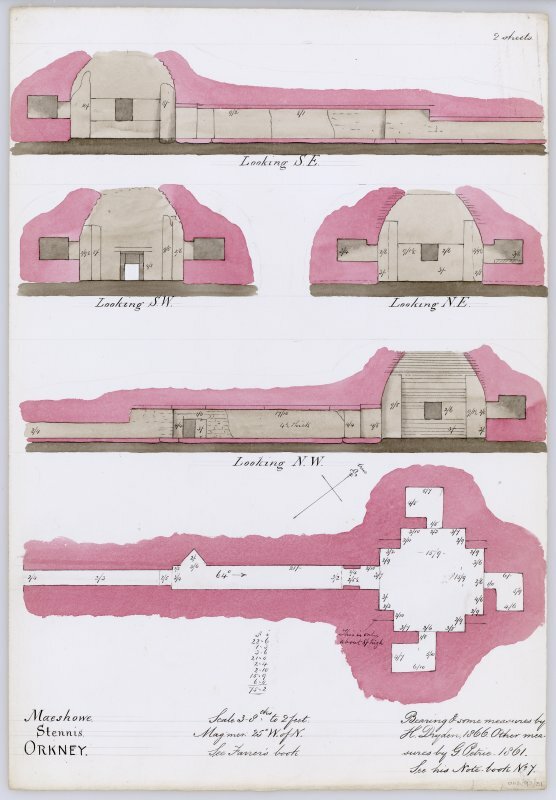 Loose drawings of sites in Orkney and Shetland in the Society of Antiquaries Collection (SAS 487), mainly by George Petrie. Vere Gordon Childe supervised excavations by the Ministry of Works, 1954-55. Between 1973 and 1974 two sections were cut across the ditch of Maes Howe, on behalf of the Department of the Environment, with the aim of obtaining samples for radiocarbon analysis. 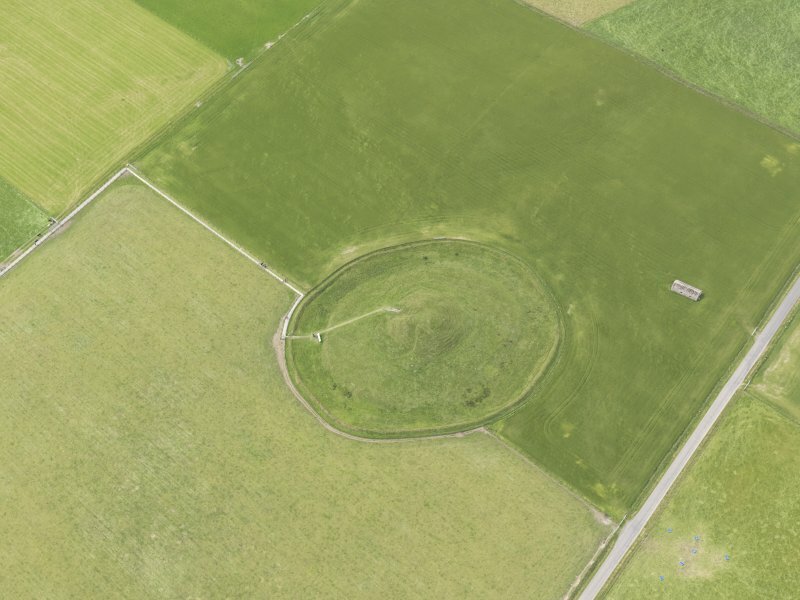 More than any other prehistoric monument, the design and execution of Maes Howe epitomises the skill of neolithic masons in Orkney, and the tomb is rightly considered to be one of the supreme achievements of prehistoric Europe. 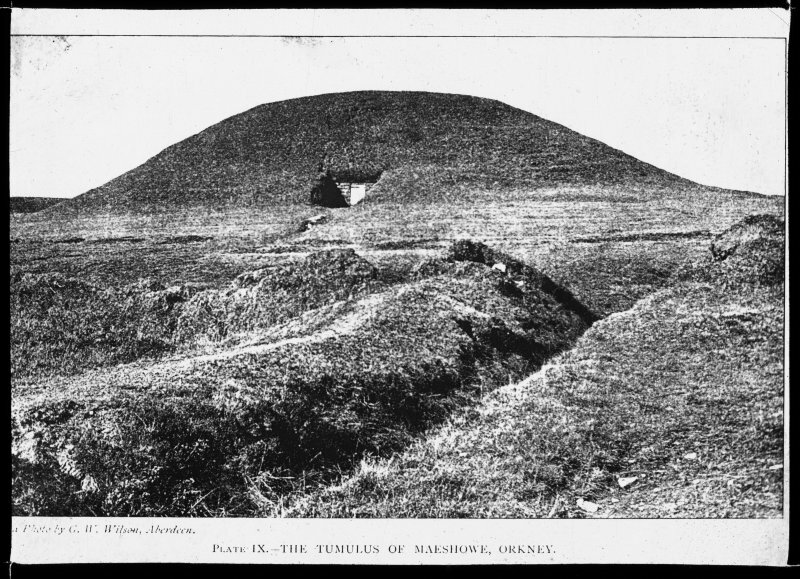 It is inevitable that such a huge mound should have been robbed long ago, and when it was opened in 1861 by James Farrer it was indeed empty of its original contents, apart from a fragment of human skull. 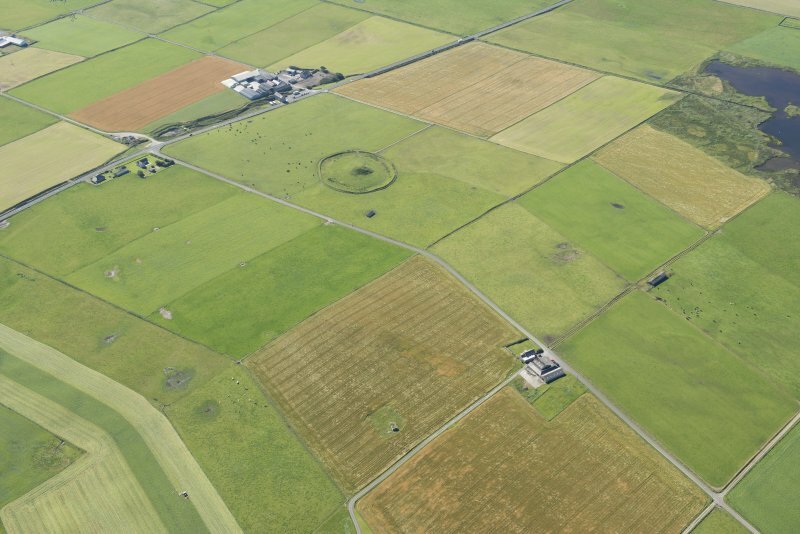 Its location, close to the great ceremonial complex of the Brodgar-Stenness circles, is presumably no accident. 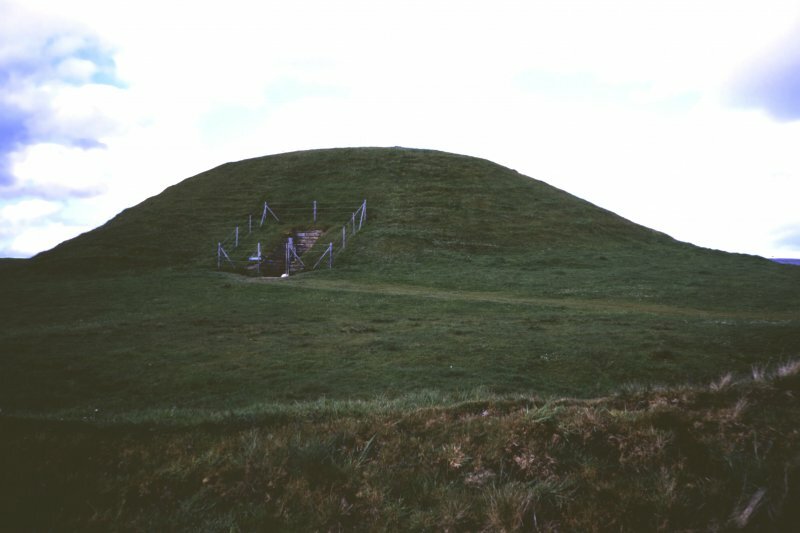 The mound was built on a levelled circular platform, encircled by a low bank composed of earth scraped up from a shallow ditch on its inner side; the mound itself, 25m in diameter and 7m high, consists largely of clay and stones, but there is an inner core of stones casing and supporting the chamber. The outermost part of the entrancepassage has been restored, but from the doorchecks inwards it is original. The great boulder in its triangular niche just inside the doorway on the left would have been drawn forwards with ropes to close the entrance. In keeping with the proportions of the tomb, the passage is quite spacious, although at a height of 1.4m it is not possible to walk upright. Note the enormous slabs with which the passage has been constructed. The main chamber is about 4.5m square and was originally about the same height, with three sidecells entered above ground-level; in each corner there is a buttress designed to help in supporting the weight of the cor belied roof. The masonry is superb, the slabs finely adjusted by underpinning or dressing to create a smooth face even where they are in fact oversailing one another towards the toof, and the tapering orthostats facing one side of each buttress not only create an impression of soaring vertical space but attractively interrupt the horizontal lines of the walls. The main chamber is about 4.5 m square and was originally about the same height, with three sidecells entered above ground-level; in each corner there is a buttress designed to help in supporting the weight of the cor belied roof. The masonry is superb, the slabs finely adjusted by underpinning or dressing to create a smooth face even where they are in fact oversailing one another towards the toof, nd the tapering orthostats facing one side of each buttress not only create an impression of soaring vertical space but attractively interrupt the horizontal lines of the walls. 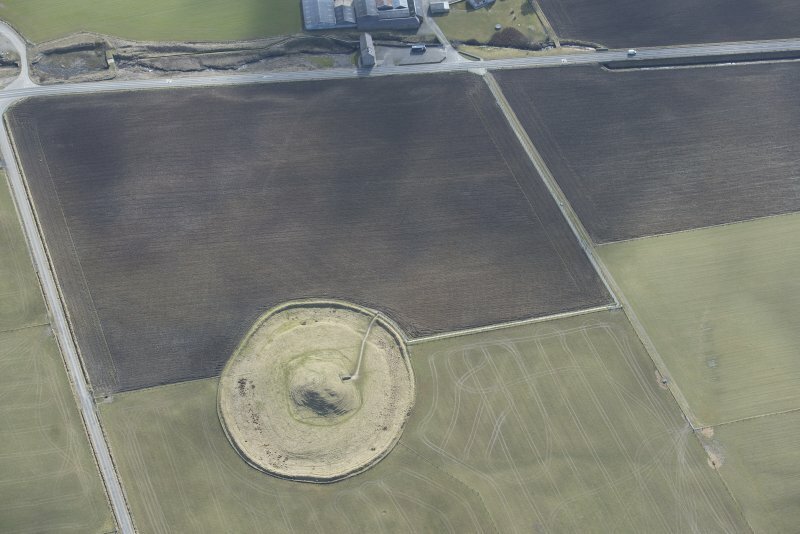 When Farrer dug into Maes Howe, he found that the chamber had already been broken into, as he did, from the top; from Orkneyinga Saga and from the runic inscriptions on the walls of the chamber, it is clear that it was intered on more than one occasion by Norsemen in the 12th century, to whom the mound was known as Orkhaugr. During the struggle between the rival earls Erlend and Harald for control of the earldom, Harald and some of his men sought shelter in Maes Howe from a snowstorm, but it was such a terrible experience that two of them went mad, ' which slowed them down badly' says the saga, though they still reached their destination by nightfall. The following winter of 1153-4, crusaders gathered together ready for a trip to the Holy Land broke into the chamber and incised some of the runic inscriptions, and there were probably other occasions as well when runes were cut there. This is one of the largest extant collection of runic inscriptions carved in stone. 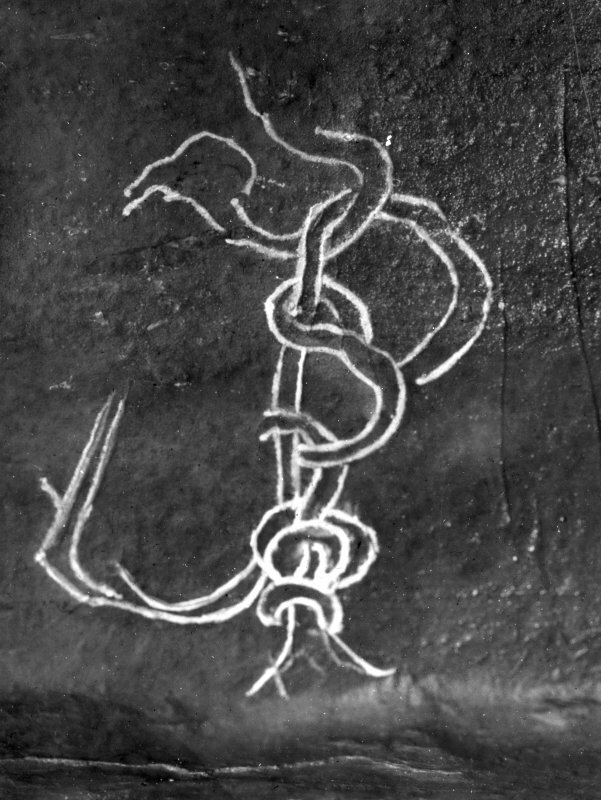 There are about thirty inscriptions, including both ordinary runes and cryptographic twig runes, and there are also some beautifully executed carvings of a walrus, a serpent knot and a dragon or lion on the north-east buttress, all in typically vigorous Scandinavian style. 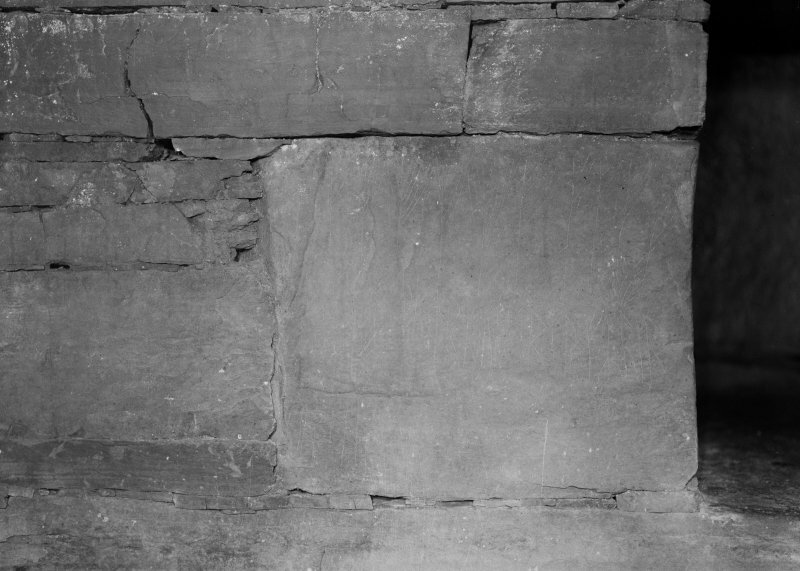 Two of the most interesting inscriptions are nos 18 and 16 (the original numbering applied by Farrer is still used) on the large block on the north side of the entrance to the south-east cell and continuing on the cell lintel, which read, in a mixture of twig runes and ordinary runes: 'These runes were carved by the man most skilled in runes in the western ocean', 'with the axe which belonged to Gaukr Trandilsson in the south of Iceland'. A superb piece of genealogical detective work by a modern Icelander, Hermann Palsson, has identified the rune-carver as Thorhallr Asgrimsson, the greatgreat-great grandson of the man who slew Gaukr Trandilsson some 200 years earlier, the story of which is told in Njals Saga. For the archaeologist trying to use objects as dating evidence, the thought of an axe still in use after six generations if very sobering! Several other inscriptions mention treasure: eg 'It is long ago that a great treasure was hidden here'; 'Happy is he who might find the great treasure'. 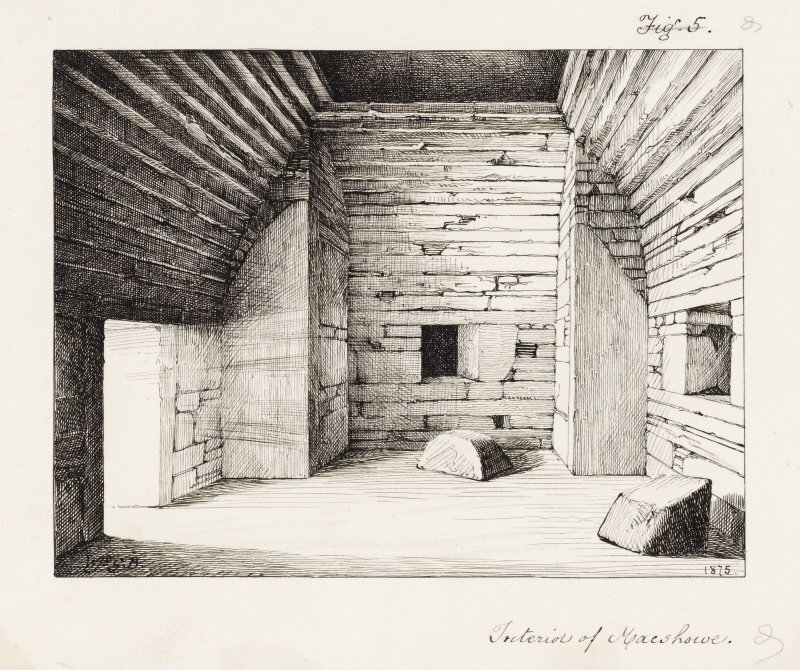 Until recently, it was assumed that this was wishful thinking and no more, as treasure to Norsemen would mean gold or silver, neither of which could have been buried with the original pre-metal neolithic occupants of the tomb. 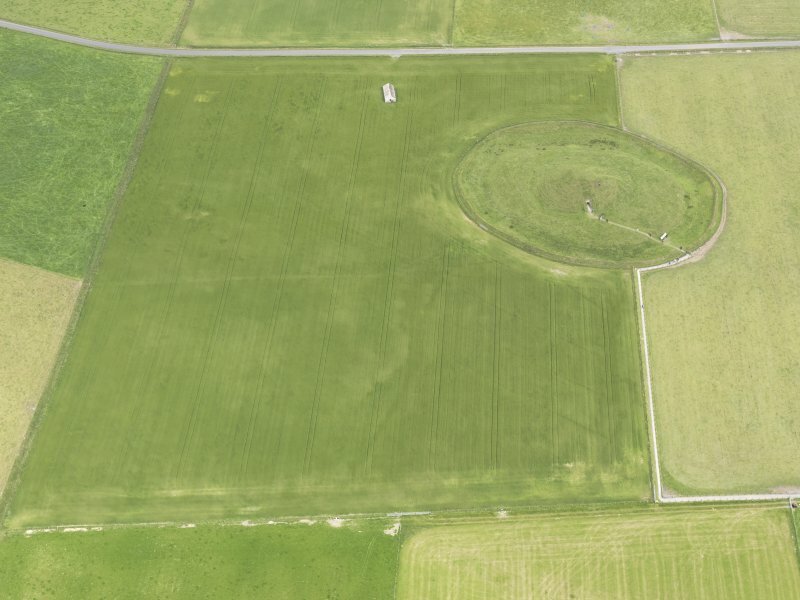 A new slant to the question arose after excavations in the 1970s, when structural evidence for a rebuilding of the bank encircling the mound was radiocarbon dated to the 9th century AD. It now seems possible that the tomb was re-used and its external appearance improved for the burial of a Viking chieftain, whose rich grave-goods were stolen three centuries later. 'Hakon alone bore the treasure out of this mound' records one of the inscriptions, while another insists 'It is certain and true as I say, that the treasure has been moved from here. The treasure was taken away three nights before they broke into his mound'. 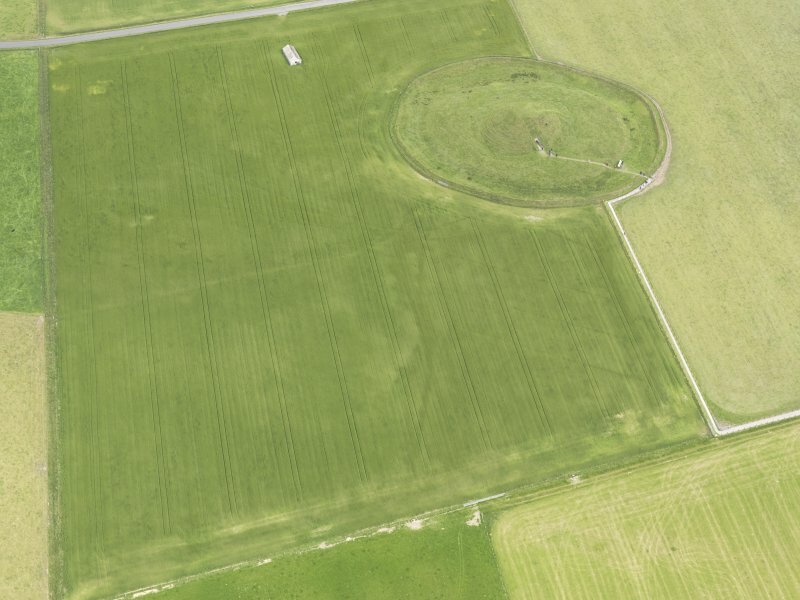 Archaeological monitoring was required at Maes Howe between the 26th and the 28th of April while a programme of rewiring was undertaken. 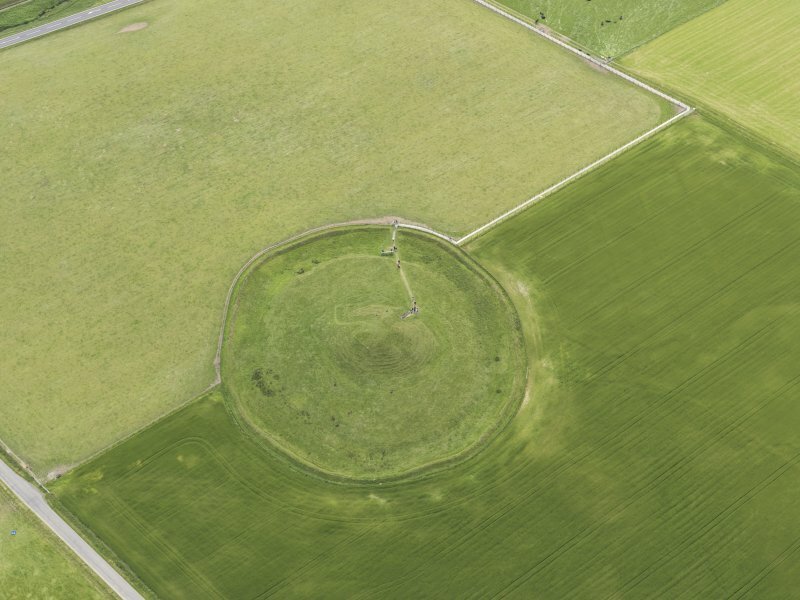 The work involved shallow excavations both within the main chamber of the monument and on the overlying mound. No finds were recovered. 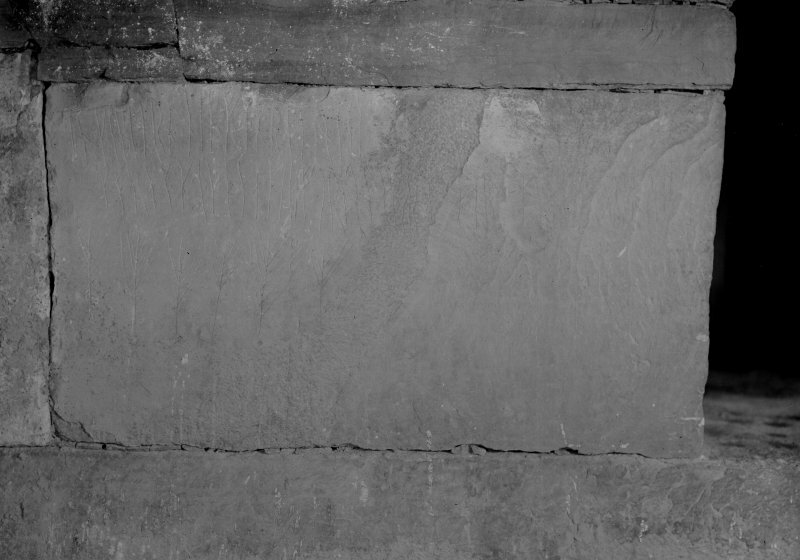 height of about 8ft 6in the slightly oblique natural fracture of the stone has been used so as to give a smooth face to the wall with an overhang of 11in; above this the over sailing is more pronounced and the courses project as 'steps' to form a square corbelled vault. The walls survive to a height of 12ft 6in, but the original roofing, probably 15ft high at the apex, had already gone at the time of excavation in 1861, and the gap is now spanned by a modern stone and concrete dome. 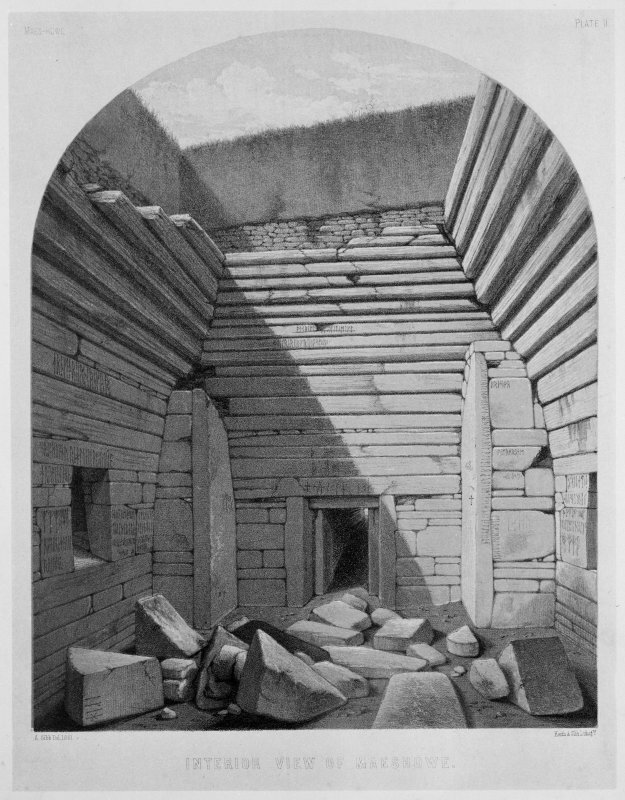 Farrer found the chamber full of stony debris. 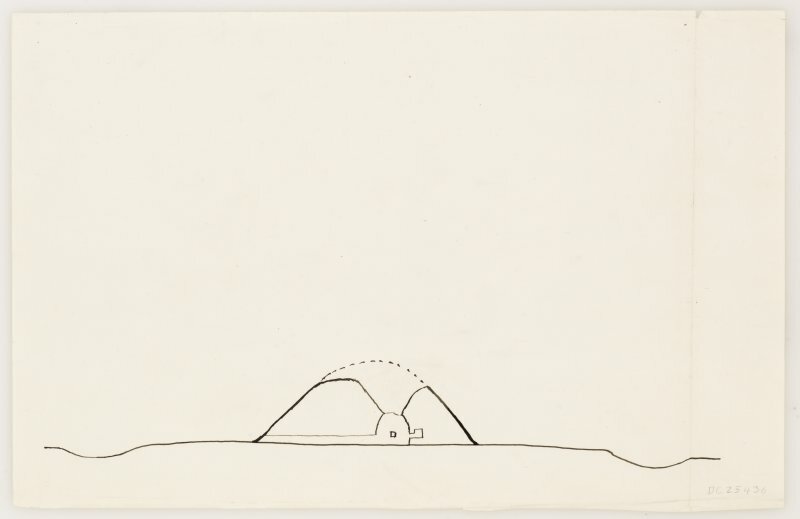 (description of excavation, plans, section, drawings of runes. Reading of runes by Profs. Stephens, Munch and Rafn. in [R1]). In each of the three walls of the chamber not occupied by the passage entrance are the entances to small compartments or cells. The openings are 2ft 8in to 2ft 10in above the ground and measure 2ft to 2ft 6in wide by 2ft 6in to 2ft 10in high. The W cell measures 5ft 7in by 4ft 9in, the N cell 5ft 10in by 4ft 7.5in, the E cell 6ft 10in by 4ft 7in, and are all 3ft 6in high. The roofing in each case is by a single slab. 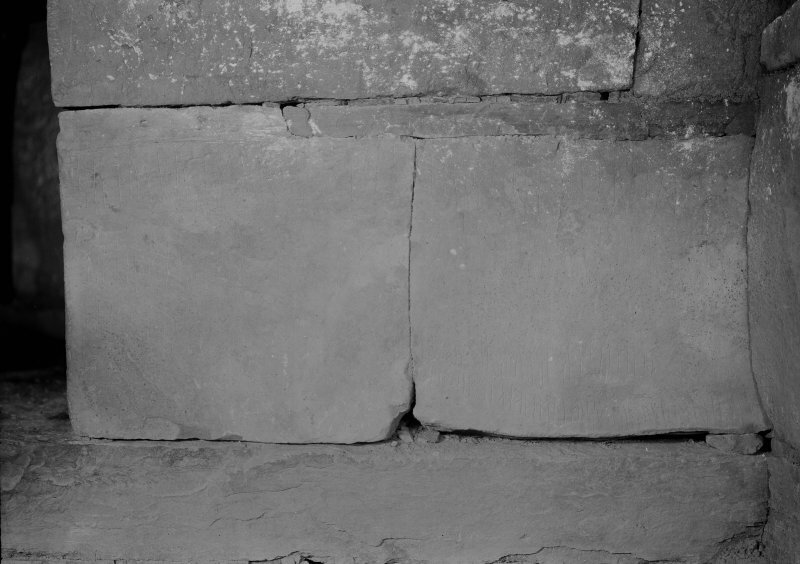 On the floor of the chamber outside the entrances to the cells lie 3 large blocks of stone which roughly correspond in size to the openings, and were presumably used for blocking them. They were found on the floor at the time of the first excavations.